This is a famous traditional valle song that you will here at every wedding, party, etc. The dance moves to valle kosovare are a bit more complicated than some of the other valle songs that you’ll hear. This song is technically the Kosovo valle tune, but it is played often here in Albania. The woman with blue eyes is what this song is focused on. 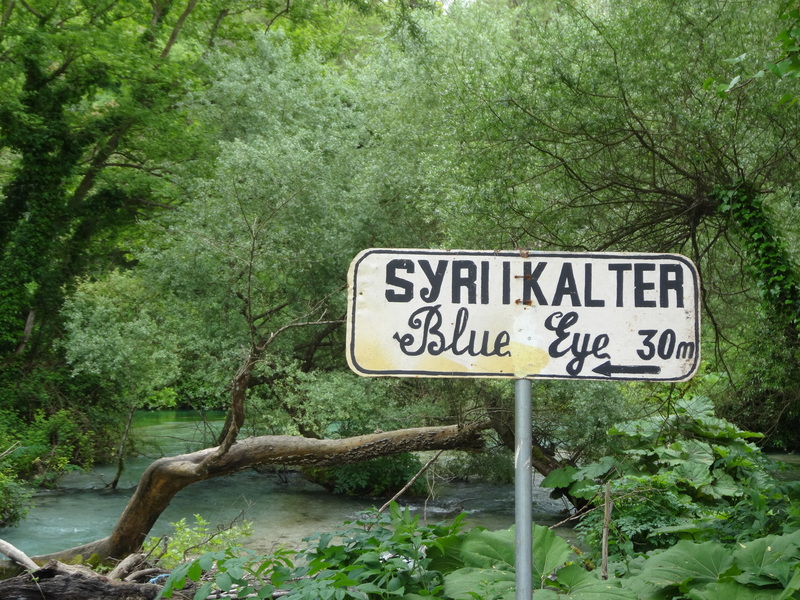 Blue eyes are rare in Albania and they are prized. This one goes out to all the girls with elusive blue eyes. I also know all the lyrics to this song because me and my boyfriend Quinn like to sing it to each other. It is another cutesy love song. This song is about a woman who wears red perfectly. She makes all the men go crazy because of how beautiful she is in red. Even though everyone wants to have her, Adrian will give her his heart and will have her in the end. This is a song from the famous singing group in Kavaje that I have actually had the pleasure of meeting. They are singing about how wonderful Kavaje is. It wouldn’t be right to talk about Albanian music without mentioning heart throb Alban Skenderaj. This is another music video set inside a mall. Gotta love it. I find this music video interesting because they are all dancing around inside the TEG near Tirana. 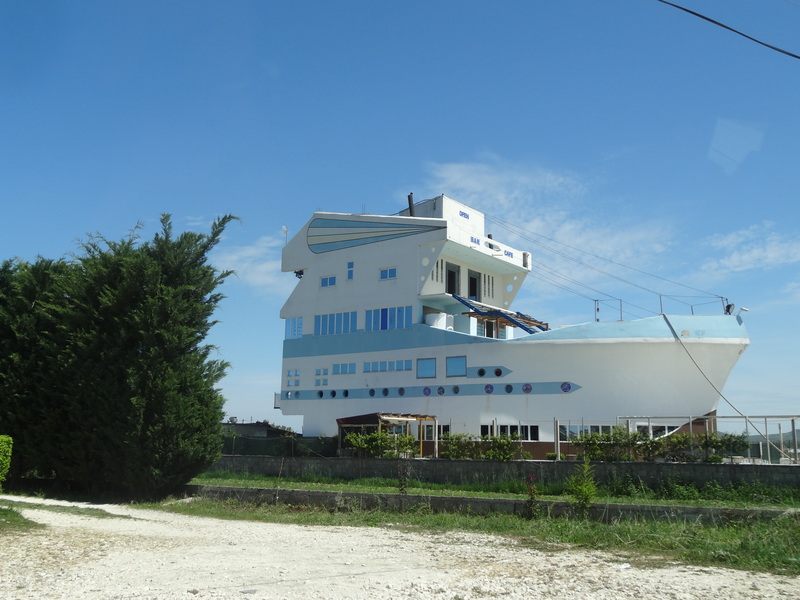 The TEG is one of the only malls you can find in Albania. This song was really popular when I first arrived in Albania and you could hear it playing pretty much everywhere. The title literally translates to “Lali has you (in the) spirit). Kuq e zi translates to red and black. 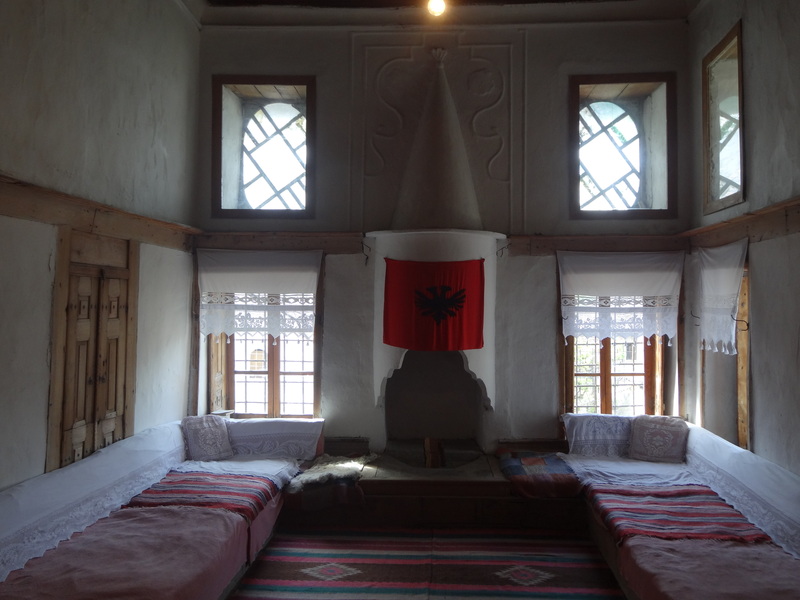 Red and black are the colors of the Albanian flag. This song talks about Shqiperia e madhe (big Albania), which refers to how Albania used to include parts of the surrounding balkan territories. Another interesting music video and love song. The two in this song are not getting along and the woman is wondering where the man went and what went wrong. Inshalah means ‘god-willing’ in Arabic. As you can see in the music video this song is referring to the husband returning back to his home if god wills. Another Albanian nationalist song. 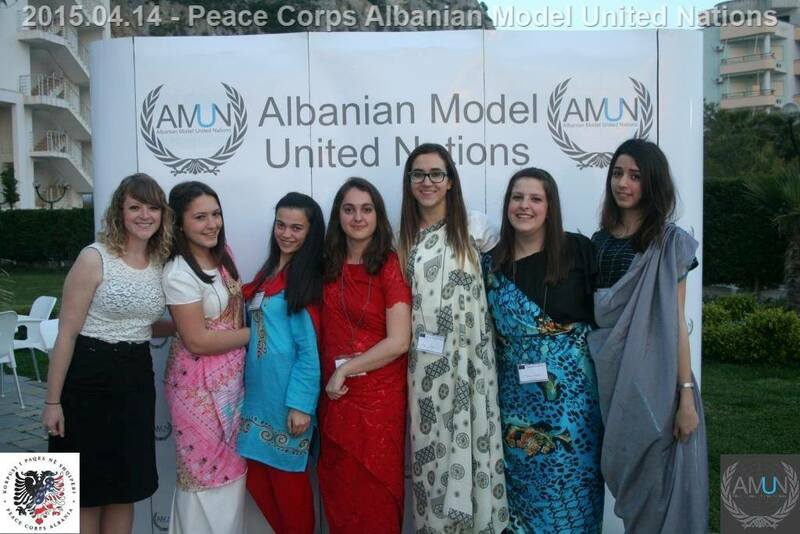 Albanians are very proud and nationalistic. This song also refers to the idea of a bigger Albania. My favorite teeny bob pop song. The boy is asking the girl for her phone number and her name because he is fixated with her. This song is a bit inappropriate. It is about a girl dancing on top of the table and partying. Another popular valle song to circle dance to. This song is from the region of Tropoja in northern Albania (a beautiful, more isolated region of the country). Another party song from the one and only Blunt. To be honest I’m not totally sure what this song is discussing, but it has a catchy beat and I hear it often here. Another song about relationships. I really dig the outfits in this music video. This song is extremely popular and nationalistic. 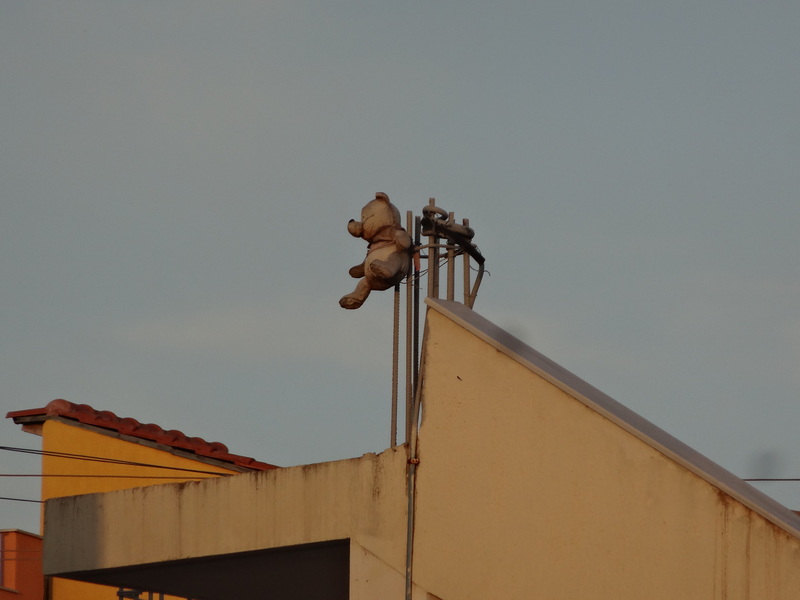 It came out after the incident in Serbia during the soccer match last year. Quinn calls it the “football, riot, cheers” song. A popular love song you will hear out at the clubs at night. This is the valle and traditional dance of the region of Tirana. Kavaje is considered to be part of the region of Tirana. You can see the difference in traditional costume in the north vs. south if you check out the valle tropojes video above. This is another one I particularly enjoy. 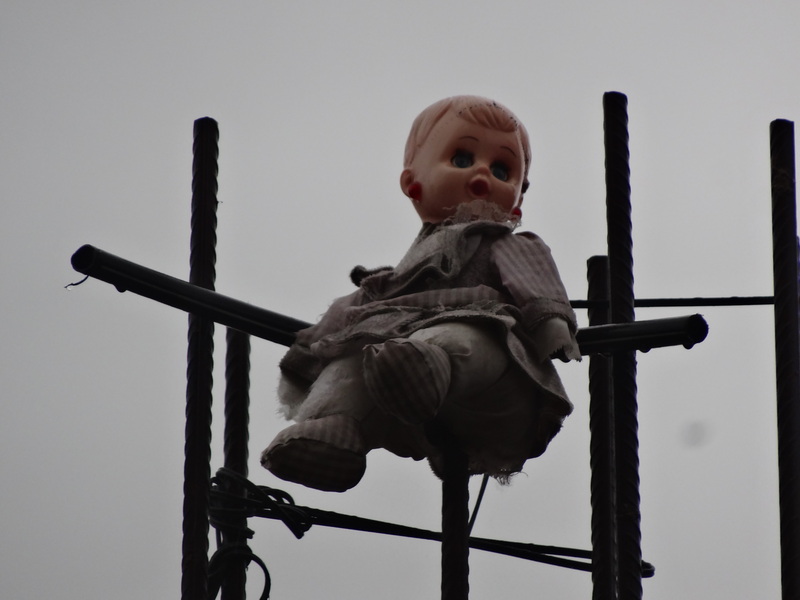 It’s about a girl who is being referred to as a doll, which is a term of endearment here. Most Albanians I know are experts at cooking large meals and love entertaining guests in the privacy of their own home. Sometimes people will go out to eat for celebrations, but it is common for families to invite each other into their homes as well. Often times things are served “family style” at restaurants, so people will order a bit of everything and people can pick and choose. 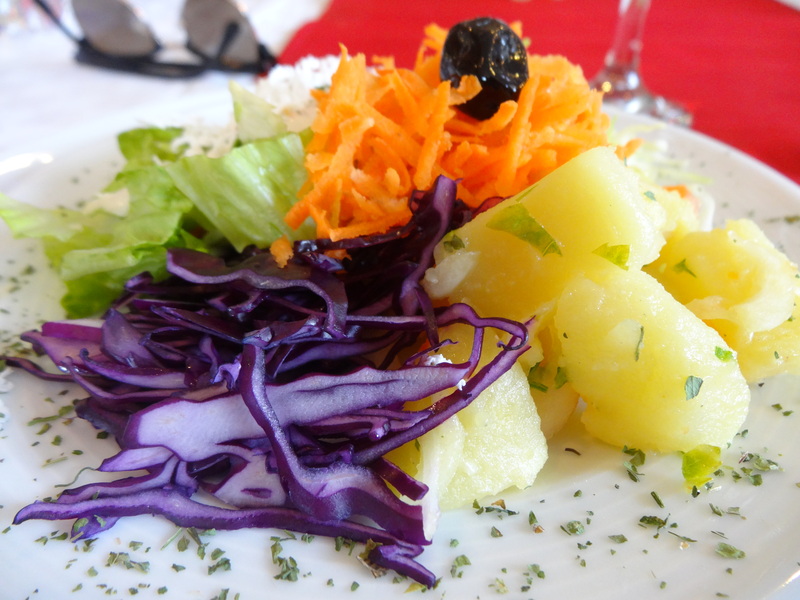 It is common to get wine, a salad to start, some side dishes, and a main entrée. 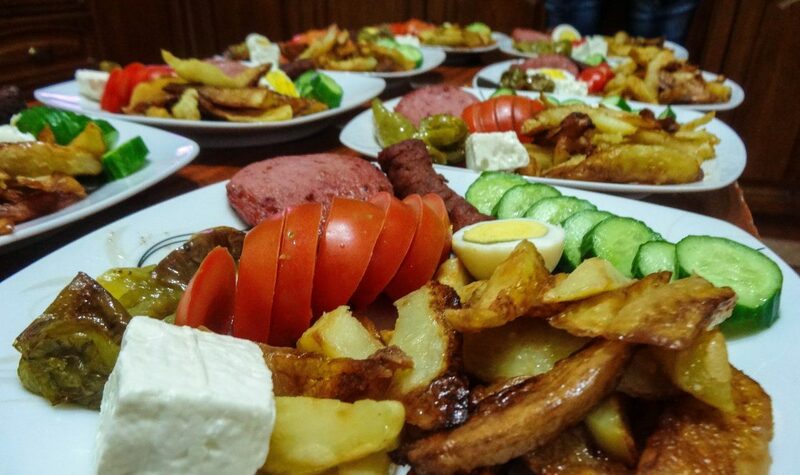 This can also hold true for when Albanians are cooking at their homes, although they might cook several different foods and then arrange each plate in a fancy manner for each individual guest. Usually salad and bread are served family style at the home. Don’t forget to wish others ju befte mire (bon apetite) during your meals shared together. I have always felt that a big part of experiencing and integrating into a culture comes from eating their food. Before Peace Corps I was a vegetarian for six years and I enjoyed being a vegetarian. I liked cooking with tofu and tempeh and eating a variety of fruits and veggies. I decided that in order to fully experience Albania that I would eat anything and everything that has been offered to me here. It has led to quite a few interested experiences for my mouth (and my stomach). 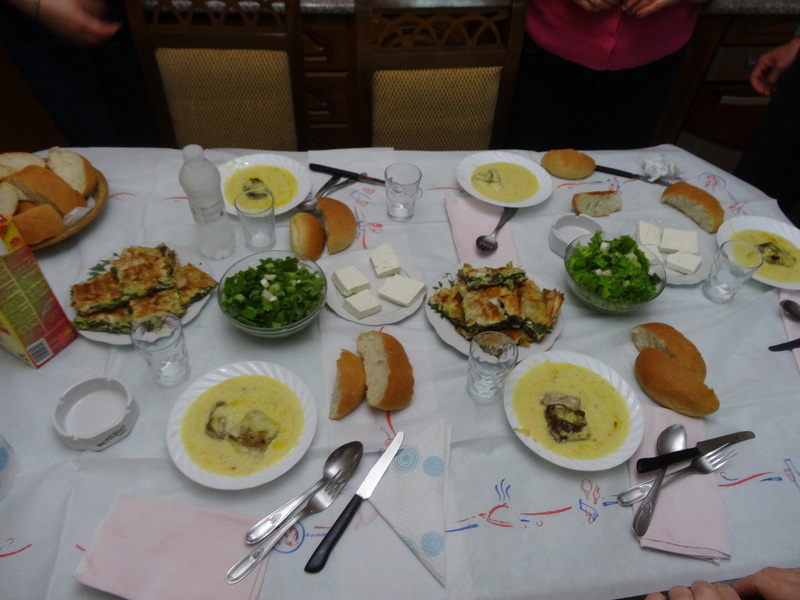 Here are some dishes I’ve had in Albania. 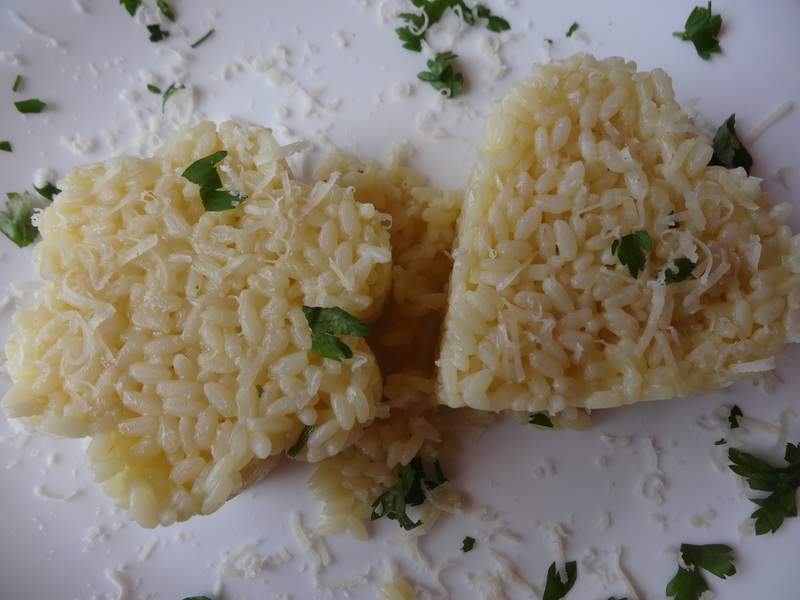 Pilaf, also known as rice, is a popular dish in Albania. Many people, especially men, eat pilaf in the morning or afternoon at a Mengjezore. Albanians love to cook pilaf with heaps of butter and usually it is served with a thin meat gravy on top. People will often order pilaf with qofte. Qofte are a kind of sausage, but different than breakfast sausage you’d eat back in the states. Often time qofte is grilled and it definitely pairs well with rice for a mid-day snack. Since I wanted to experience all Albania had to offer, I put my vegetarian ways aside and tried all the meat. In Kavaje there is a small hole in the wall Mengjezore literally a minute walk away from my work and they serve THE BEST fried chicken ever. I usually order it with garniture (garnish), so it will come with a bit of salad and sauce kosi (yogurt sauce). Fasule is hands down my favorite Albanian dish because it is super simple and it is vegetarian. Fasule literally means beans in Shqip, so you can only imagine what fasule is… You guessed right! It is made with beans. Fasule is a bean soup that often has a tomato and onion base. Sometimes when I have received homemade fasule from my student’s parents, they all know that I am obsessed with fasule, it has other vegetables such as carrots. Over the winter it was pretty cold, so I perfected my fasule recipe… still isn’t quite as good as the Albanian’s recipes though. Fruits and vegetables are fresh and plentiful in Albania. I will definitely miss stepping outside of my house and literally not even walking a minute to buy produce that would put Whole Foods to shame. My region, central Albania, is full of fresh produce because we have land perfect for farming and many people in the surrounding villages and areas farm. My host family in the village of Pajove would grow most of their own produce in their own backyard. How’s that for sustainability! 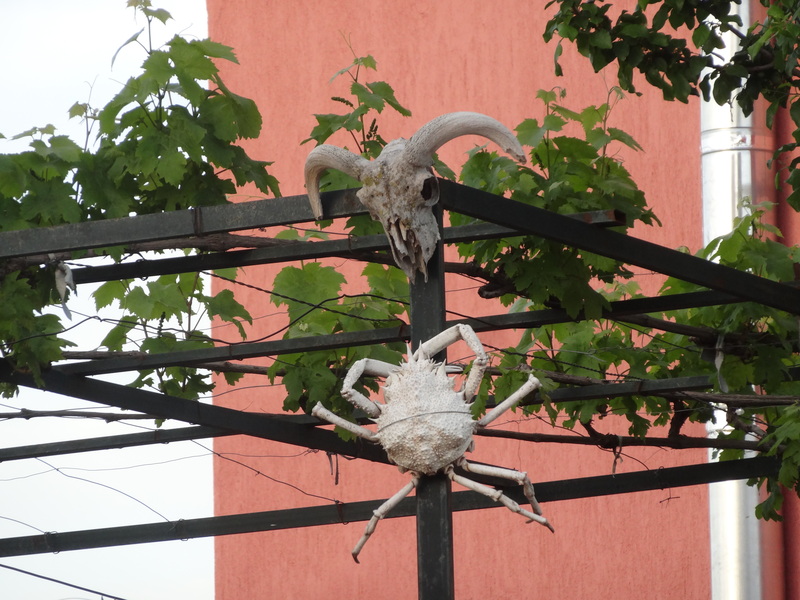 Sheep head is a popular dish for special occasions. 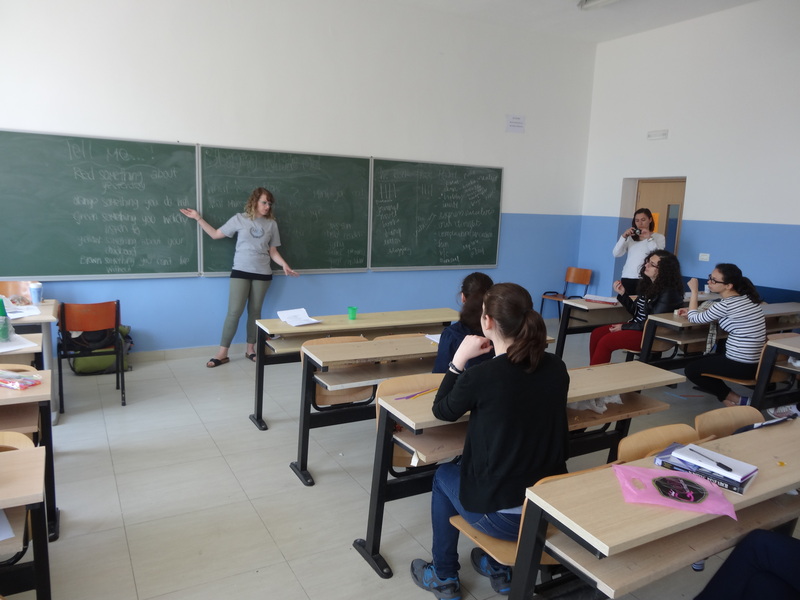 Luckily I had some pretty amazing language teachers during our 10-week pre-service training when I initially moved to Albania back in March 2013. Our language teachers cooked me and the other Peace Corps volunteers in my village sheep head for our end of training celebration. It is custom to eat the entire head – brains, eyes, tongue, EVERYTHING. We all had a pretty interesting time tasting all the different parts of the head. My favorite was definitely the tongue. Albania would be the worst place for someone who is trying to live a gluten free lifestyle because bread is everywhere. And bread is delicious. And bread is ridiculously cheap. You can buy an amazing, fresh loaf of bread straight from the oven for less than 50 cents. What a bargain! I have found an amazing bread in Kavaje that is darker and made with sunflower seeds and other magical ingredients. 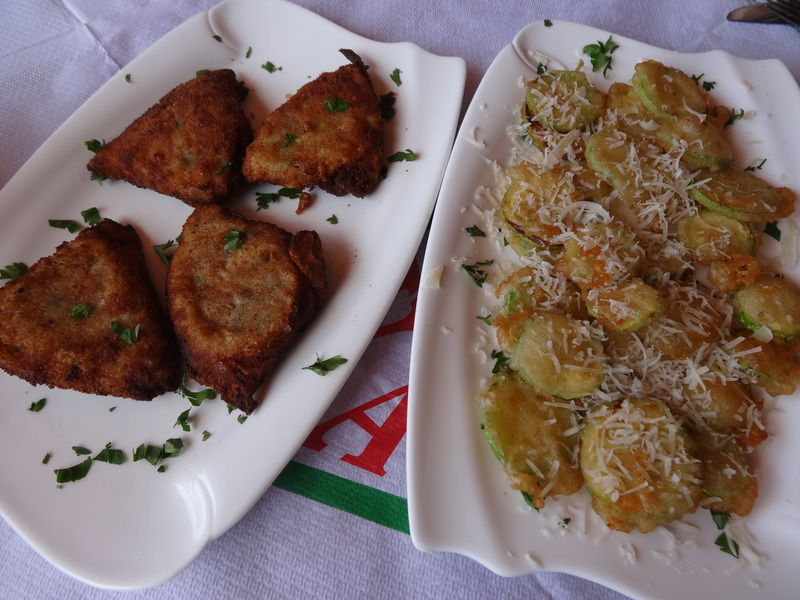 This is another one of my favorite Albanian dishes, and it is usually vegetarian for all you veggie lovers out there. Stuffed peppers are a classic Albanian side dish. Usually the peppers are baked with tons of olive oil and stuffed with rice and other vegetables. Sometimes they are also stuffed with meat. At many Albanian restaurants they will only serve stuffed peppers if you pre-order them several hours ahead of time because they take a while to prepare. Mmmmmmmm, I love byrek. And so do most other Americans that I know. I’ve mentioned this amazing gift of food before in my blog. 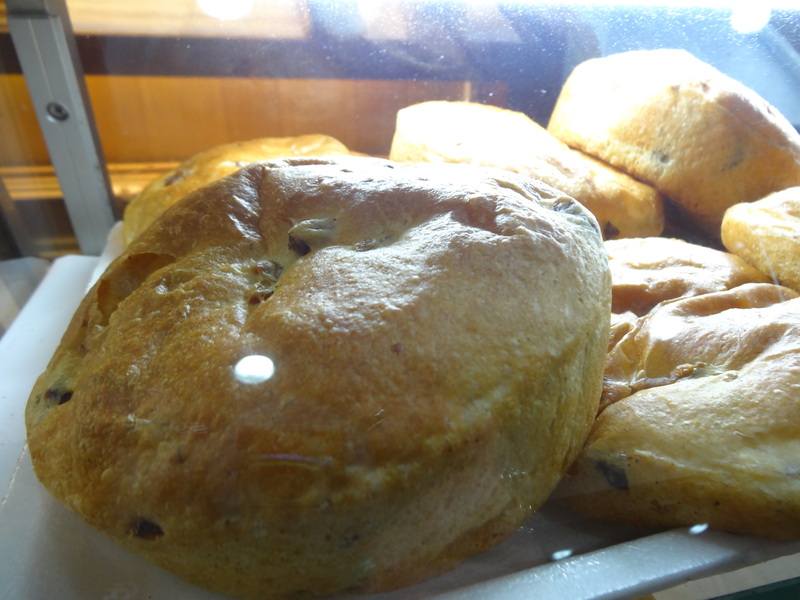 Byrek is made all over the country and it is a flaky pastry made with phylo dough. 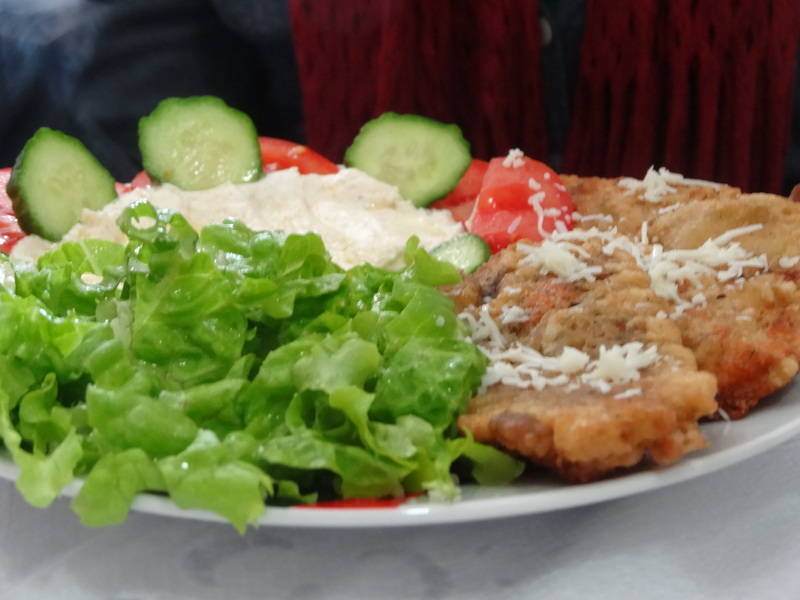 It is usually made with different kinds of fillings such as spinach (especially during the winter months when it is fresh), tomatoes and onions, meat, or gjize (a crumbly Albanian cheese). 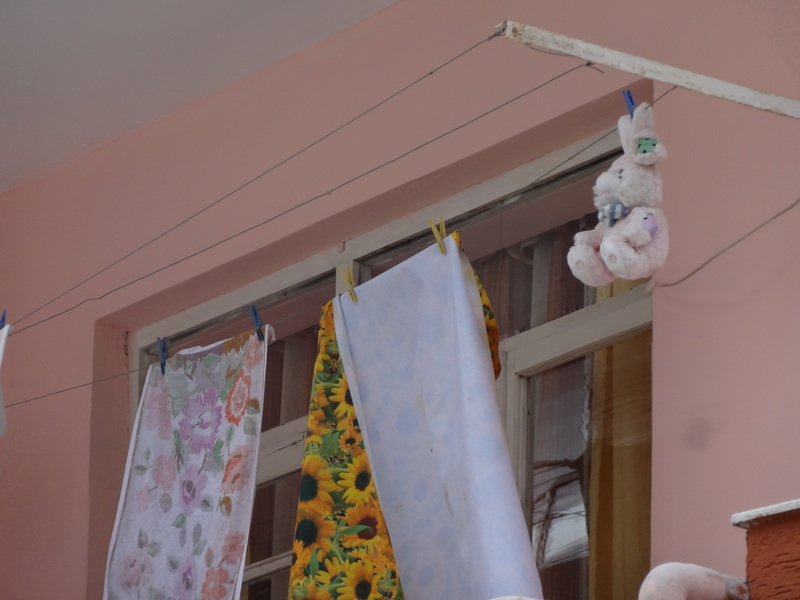 Byrek is not only found in Albania, but can also be found in different forms throughout the Balkans. Most people when they think Baklava may think of Turkey, which is a great with amazing Baklava, but Albanians also make a great deal of baklava. Baklava is usually made around New Years Eve and other big holidays. 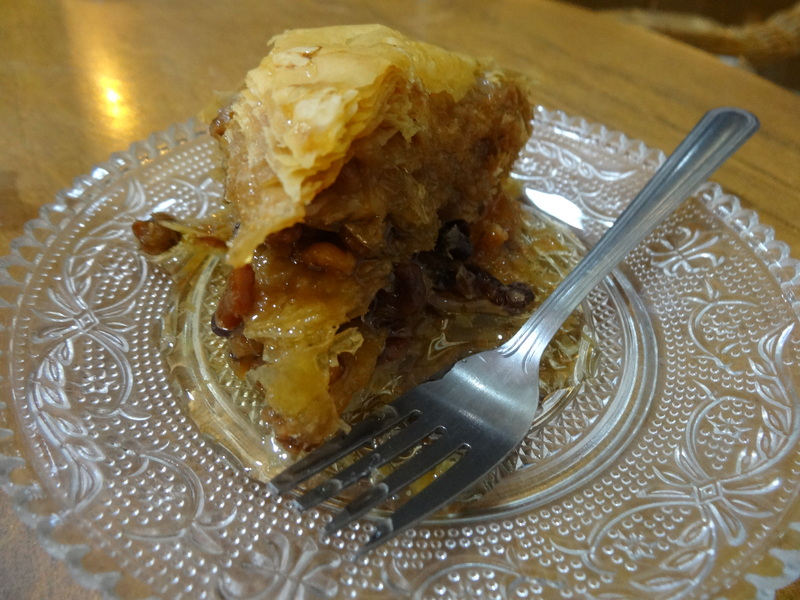 Most families will make baklava in their homes, but you can also find it at grocery stores and pastry shops. I love eating Albanian baklava, but be careful because it might give you a sugar rush. Most baklava I’ve had is covered with homemade sugar-water syrup. 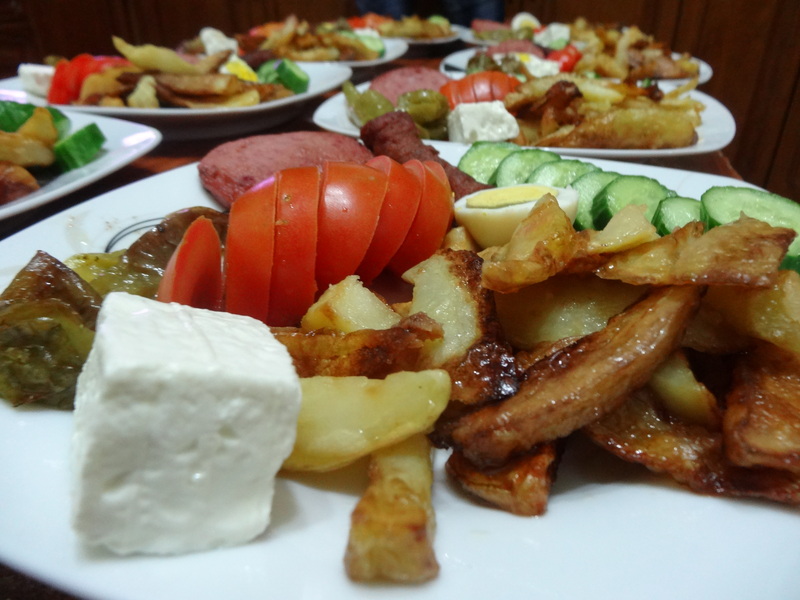 It isn’t right for me to have an Albanian food blog without mentioning potatoes because Albanians eat a lot of potatoes. Potatoes can be found year-round at the markets and they are pretty cheap to buy. Usually potatoes are cooked as fries here and they are often doused with a bunch of olive oil. I had to have a conversation with my host family once about how much olive oil they use when cooking potatoes and cooking pretty much everything actually. We talked about how yes, olive oil is good for you, but only in moderation. If you use a cup of olive oil to cook your potatoes it kind of defeats the purpose. 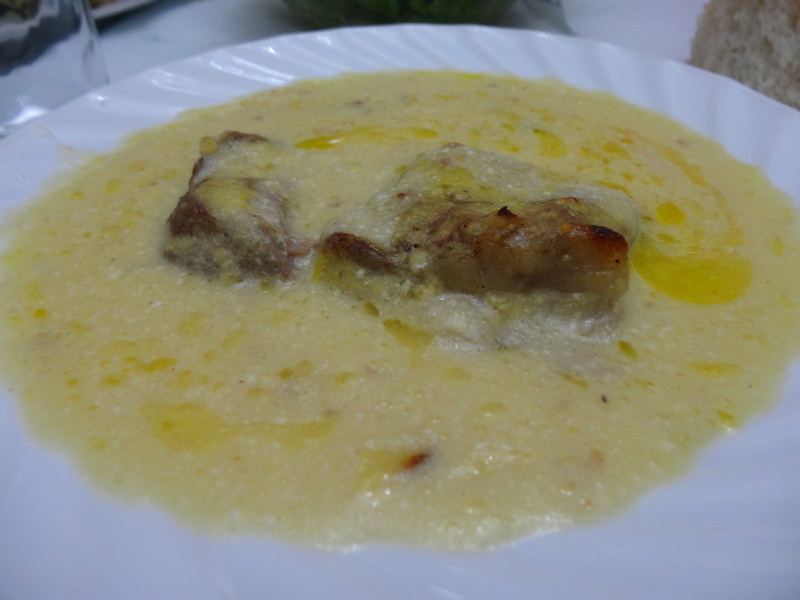 Tave kosi is a dish that is served on special occasions when Albanians have important people over to their house for dinner. Luckily, I have some amazing students who invite me over to their place for dinner occasionally and her mom has made me this dish. Tave kosi is baked lamp in a special yogurt sauce. To be honest it is not my favorite Albanian dish, but it is widely popular and it is considered an honor to be served. For some reason I thought pizza would be one of those food items that I would not be able to find in Albania, but alas pizza is abundant in the land of eagles. There is fast food pizza all over the place and some of them even deliver! I have never gotten a pizza delivered because it would literally only take me ten minutes to just walk to the pizza shop myself and order something. Plus we have an amazing pizza joint in Kavaje that I like to go to for the friendly atmosphere and banging vegetarian pizza. Fruta deti translates directly to “sea fruits,” but it is the term used for ordering seafood. 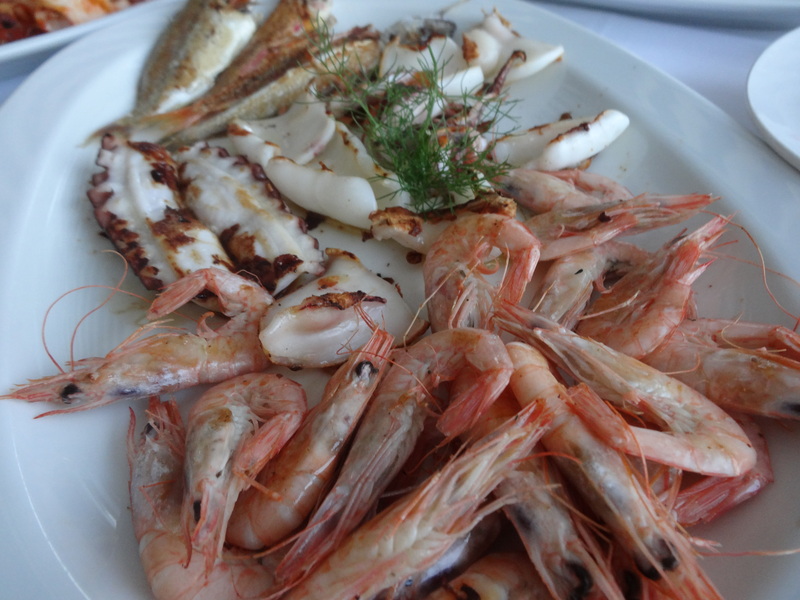 If you are near the sea having some fresh seafood is a must! You can find great calamari, cod, and mussels along the coast. The mussels are especially delectable in Saranda because they farm mussels in that region. 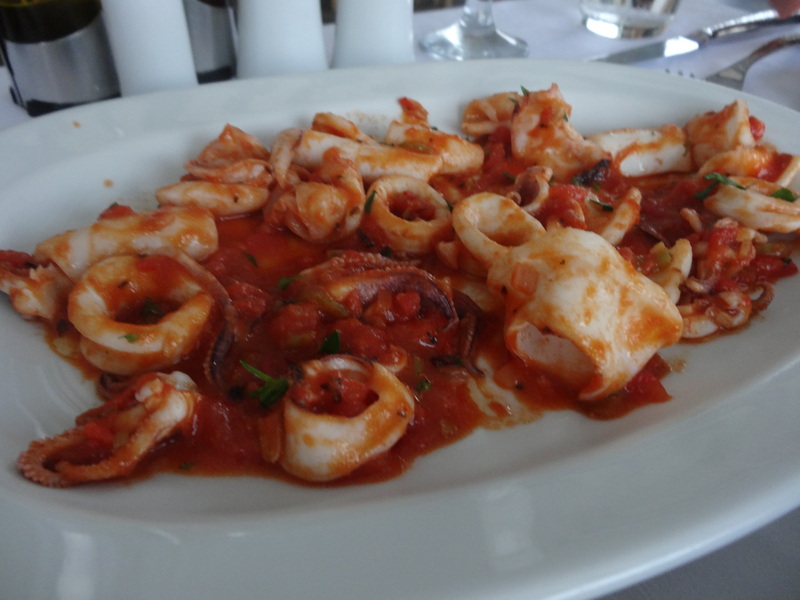 When out for a nice seafood dinner in Albania I recommend going all out and ordering an arugula salad, white wine, mussels, calamari, a fish, and even seafood pasta. Since the prices are so cheap here you could have a nice meal for four ordering all that food for under sixty dollars. Turshi is basically pickled cabbage and is super popular amongst Albanians. You will often see this dish during the winter months when cabbage is cheap and in season. You can also find other pickled vegetables that would fall under the category of turshi. This dish is often accompanied with bread, of course, and/or meat. Greek salad is a very popular starter dish here because of the access to cheap and delicious produce. This especially holds true for the summer months when you can by a kilo of tomatoes or a kilo of cucumbers for less than fifty cents. 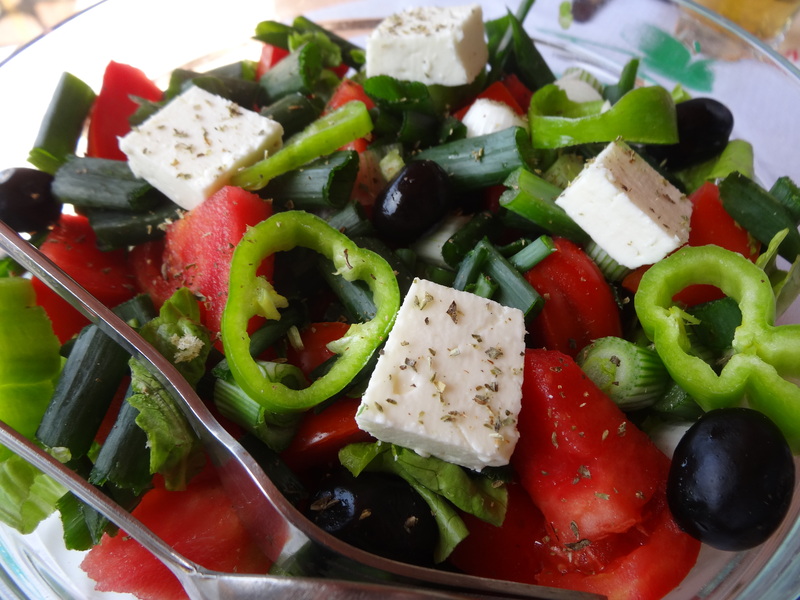 Greek salad is usually full of cut up vegetables such as tomatoes, onions, and cucumbers. Along with that there are usually fresh olives and cut up feta cheese. Sometimes you will even get a bit of green lettuce as well, but not always. Salad dressing isn’t really a thing here, so people usually top these salads with a bit of olive oil, vinegar, and salt. Wahlah, the perfect salad. Most Albanians I talk to think of fast food when they think of America, but Albanians love fast food too (especially the younger generation). Many students grab fast food during their breaks between school or after school for lunch. Sufflaqe is like a gyro. It is served on pita bread with grilled lamb from a rotating skewer, like they serve at the chain gyro restaurant Renzios. Topping the sandwich is usually tomato, onion, lettuce, mayonnaise, mustard, and yogurt sauce. Ice cream is big in Albania. I mean really big. I mean big enough that people literally eat ice cream for breakfast. It is always time for ice cream in Albania during the summer months. There are numerous ice cream parlors and sweet shops all across every city. Even some nicer coffee shops have ice cream for sale because people like ice cream that much. If you’re looking for some good gelato (maybe even better than some Italian gelato) head down to the Vogla beach boardwalk area in Durres and have some scoops at the shop across from the Wild West Restaurant. I can guarantee it will satisfy your taste buds. Sit-down pastry shops/coffee bars are trending in Albania and recently a new bar in Kavaje opened up at Myrizi. It has a bunch of delicious desserts and an atmosphere for the entire family to enjoy. 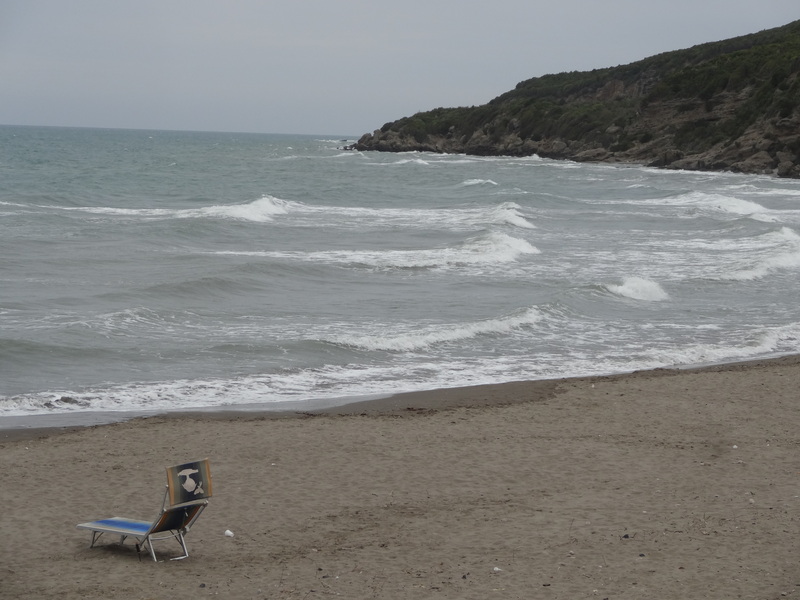 Have a week to spend in Albania? I suggest you follow this amazing itinerary that I created for my Dad’s first trip outside of North America. 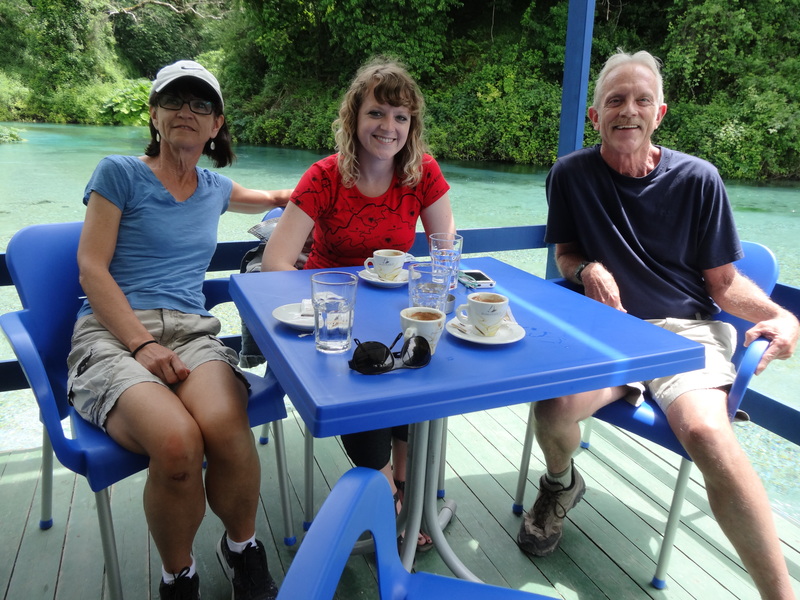 My Dad and his partner Nancy recently came to visit me to celebrate the end of my Peace Corps service and to get a taste of the beautiful country I have been inhabiting for the past two years. I wish we could have spent more time together traveling the country (because there are SO MANY WONDERFUL PLACES to visit), but sadly I am extremely busy trying to finish everything up before I officially end my time as a Peace Corps volunteer on May 29th. 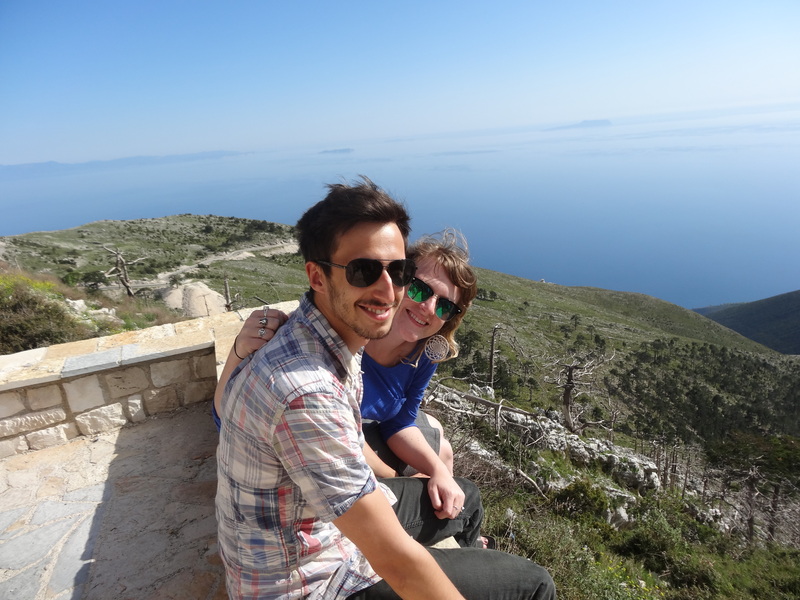 Luckily, they were both able to take a week off work and we were able to see a good portion of southern Albania. 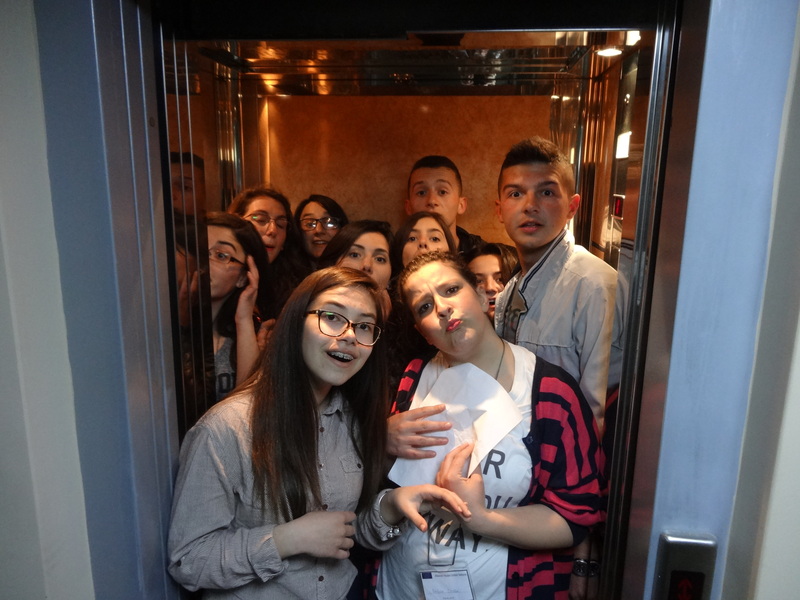 Check out our trip below! My parents arrived at the Tirana International Airport in the afternoon after a long trip from Colorado and they were pretty tired. We rented a car because public transportation can be unreliable and often tacks on several hours of travel time. We also wanted the freedom to travel in the evening and see things on our own time. I’d definitely recommend renting a car if you can afford it. It is only about thirty euro per day to rent a car here, so it’s pretty cheap. 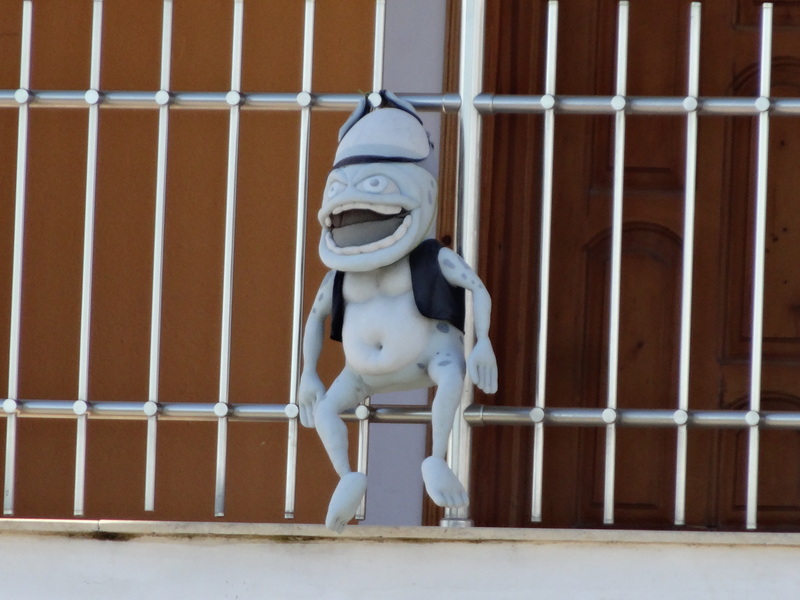 Our first day we spent exploring the city of Kavaje. This is the city I have been living in for the past two years, so it was a must that my family experience a night in my town and a night living in my apartment. I think they both got a kick out of the layout of my apartment and it was definitely an experience for them using a Turkish toilet for the first time. We went to my favorite seafood place in town with my sitemate before they fell asleep from exhaustion. 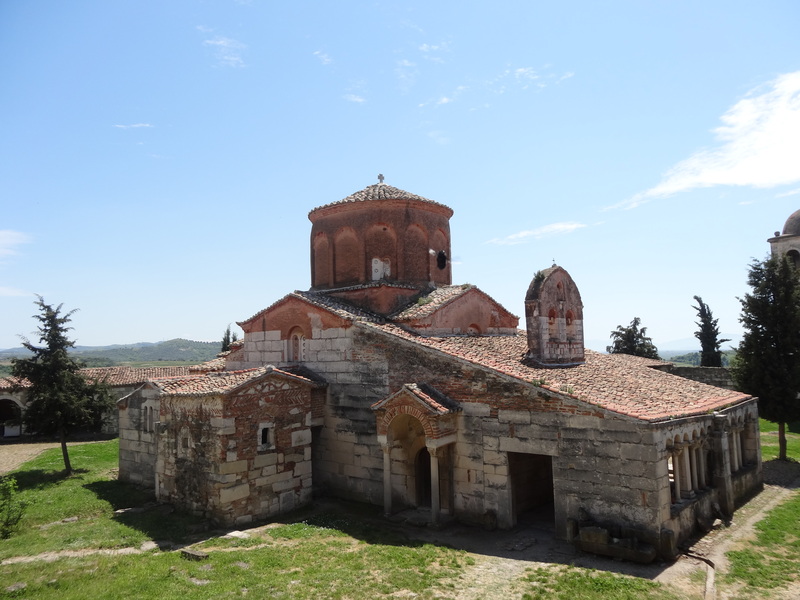 Kavaje is not a tourist city in Albania, but it could become one in the future because the local government is redoing the entire city center and making everything a lot more bukur (beautiful). If you’re traveling to Albania I would recommend spending your first (or last) couple of nights in the capital city of Tirana rather than in Kavaje. There is a lot to do there and you can find many delicious restaurants and bars in the block area. 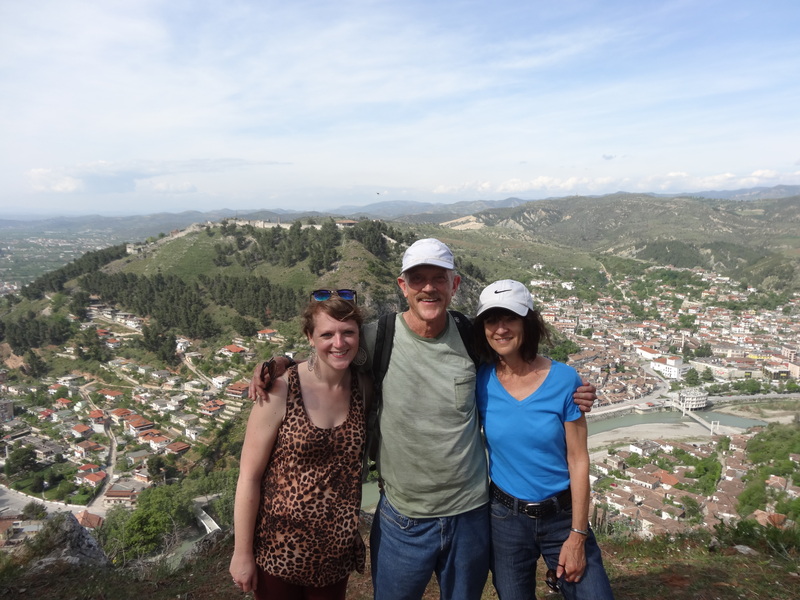 The second day we traveled down to meet my boyfriend Quinn and visit the UNESCO heritage site of Berat. 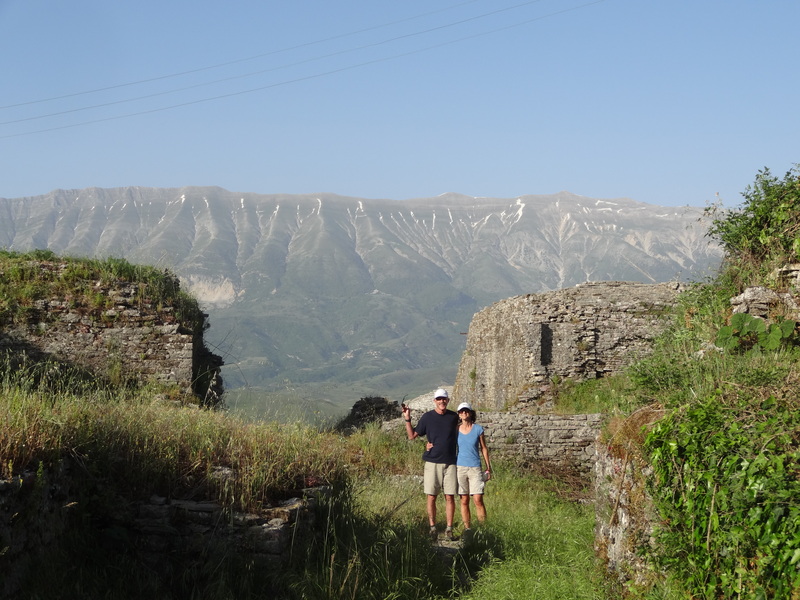 Berat is a must-see city for tourists because it is full of history, hiking, and beautiful scenery. 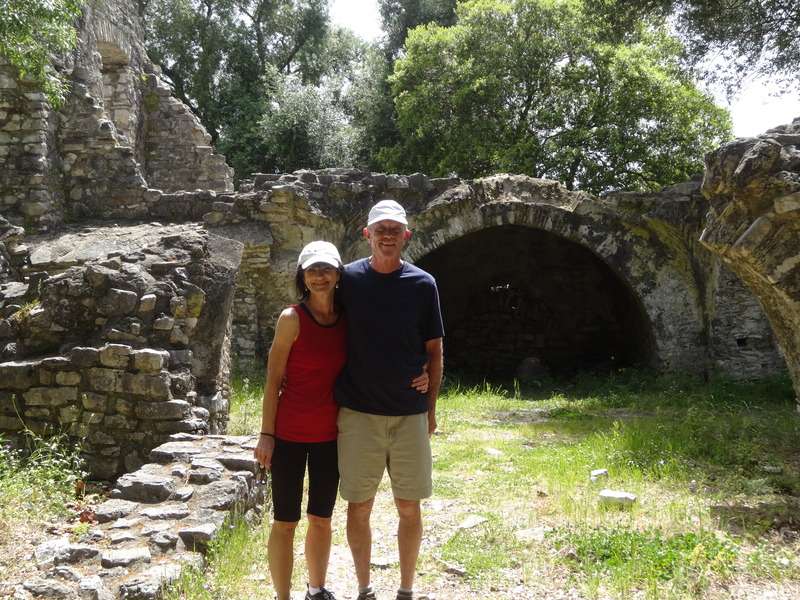 While in Berat we went on the herbatorium hike up the mountain on the other side of Osum river. To get to the top of the mountain it took about an hour. I was surprised because the trail was actually marked well in the beginning (although towards the end it wasn’t quite as easy to follow). After the hike my parents went up to the castle and then we all had dinner at Mangalemi. My parents also stayed at the Mangalemi hotel and it was very impressive. Mangalemi was the most expensive hotel during the trip, but it also had some of the nicest amenities and all of the rooms have been renovated. 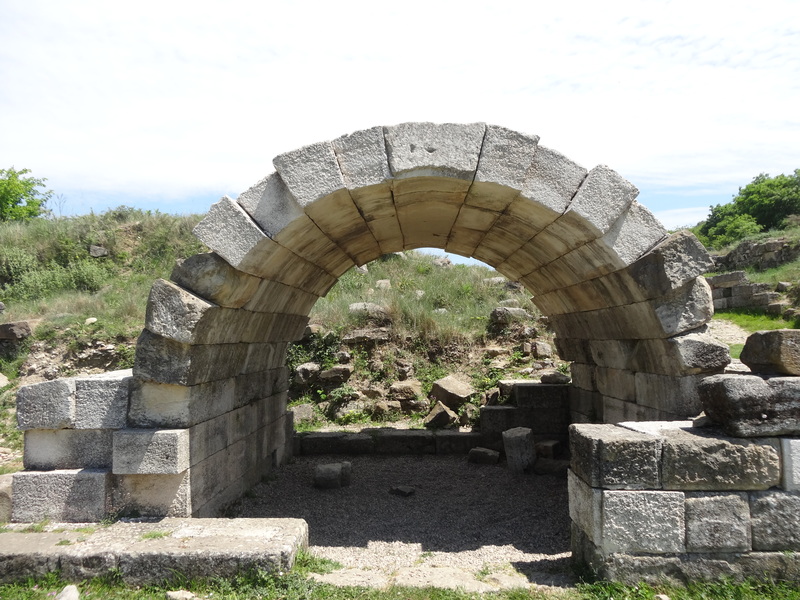 We went from Berat to Fier and took a small side-trip to the ancient site of Apollonia. 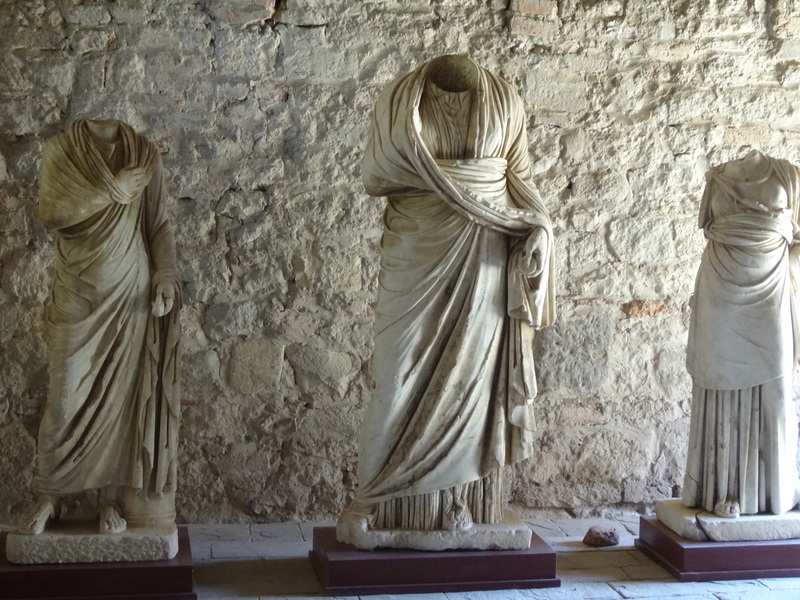 Apollonia was a beautiful place to stop and see some ancient architecture and statues. I am not sure what the normal price is to enter Apollonia because no one actually charged us to enter the sites or the museum. 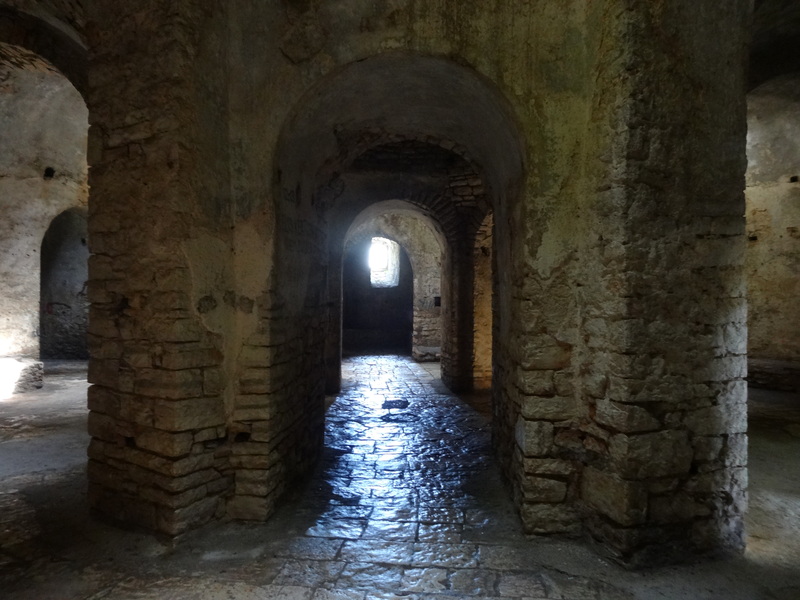 You never know whether you’ll luck out while visiting Albanian castles and historical sites because sometimes you have to pay and sometimes you don’t. 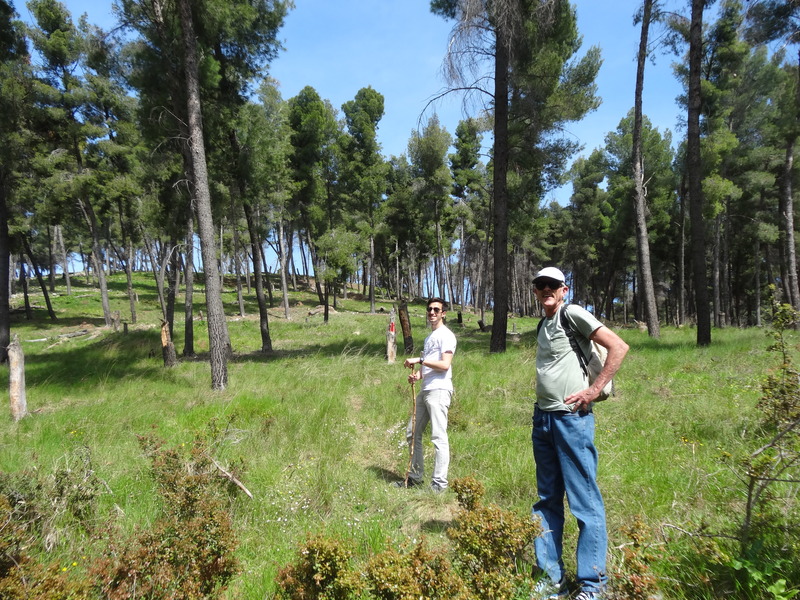 After Apollonia we stopped for pizza in Fier. Peace Corps volunteers love to have pizza in Fier because they have barbeque chicken pizza, which is extremely rare here. It’s always nice to have a taste of home right in our own backyard. 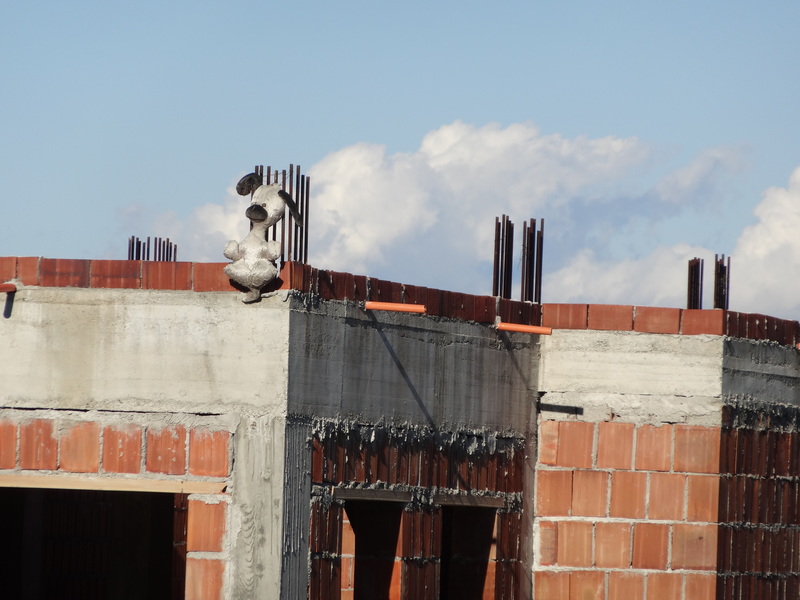 Once we filled up on pizza, we continued our way down south to the small beach town of Himare. Himare is on the southern coast in between Vlore and Saranda. It takes a while to travel down to Himare, but the view along the way is beautiful. Most of the drive is along the coast, with a short portion in between the southern mountains. 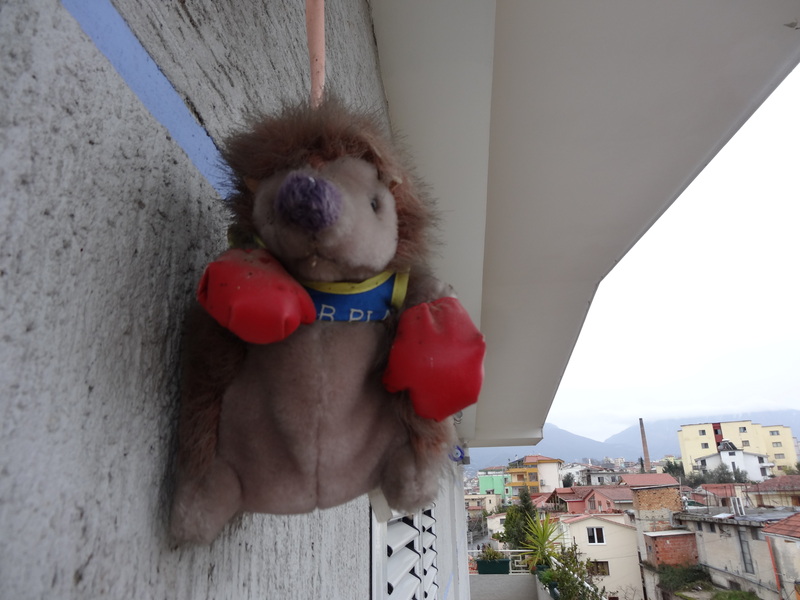 In Himare we stayed at an Airbnb apartment that another volunteer recommended to me. 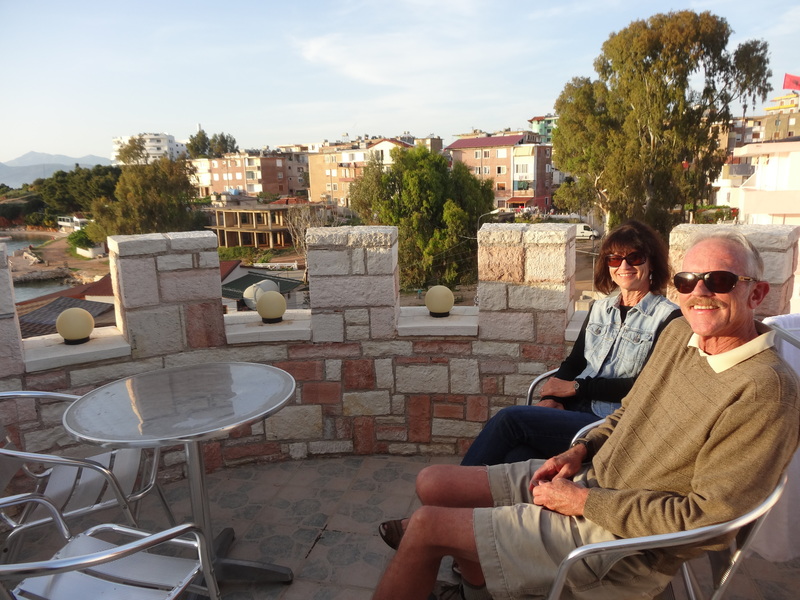 It was absolutely wonderful and had a beautiful panoramic view of the coast and town with breakfast included. We went to dinner at a seafood restaurant in town and had coffee the next morning in the center near the beach. I went for a brief swim, but the water was still pretty cold. I hear it begins to warm up a bit more in late-June and remains that way throughout the summer. Beware though because there are a lot of tourists in July and especially August. On our fourth day we continued driving down the coast to Ksamil which is one of the most southern cities in Albania. On our way down we came across a castle that was built on a small island in the sea. We thought it looked neat and it was only accessible by private vehicle (or by walking from the highway), so we decided to check it out. 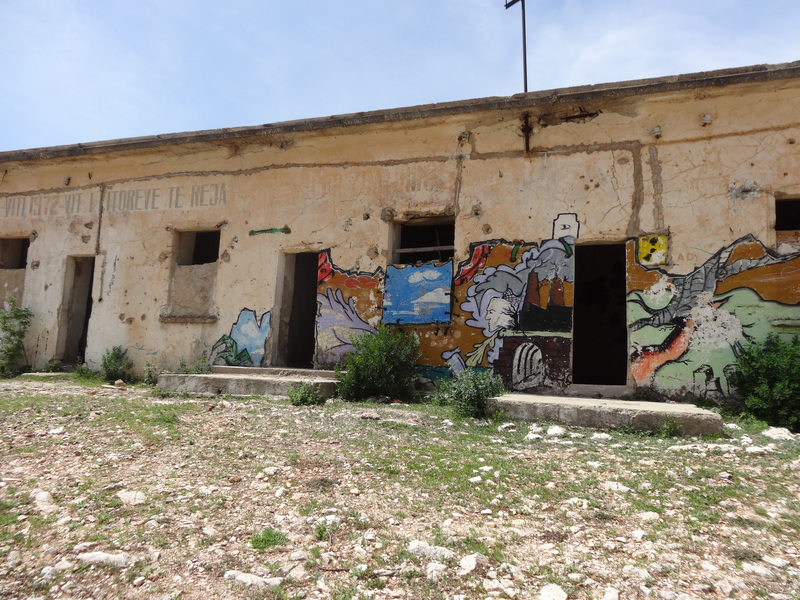 Before we headed up to the castle I noticed an abandoned building that was decorated with colorful street art. The paintings masked a portion of the cracking exterior of the concrete block structure, so of course that was very intriguing. Me being me, I decided to check out what was inside and was in shock at what I found. 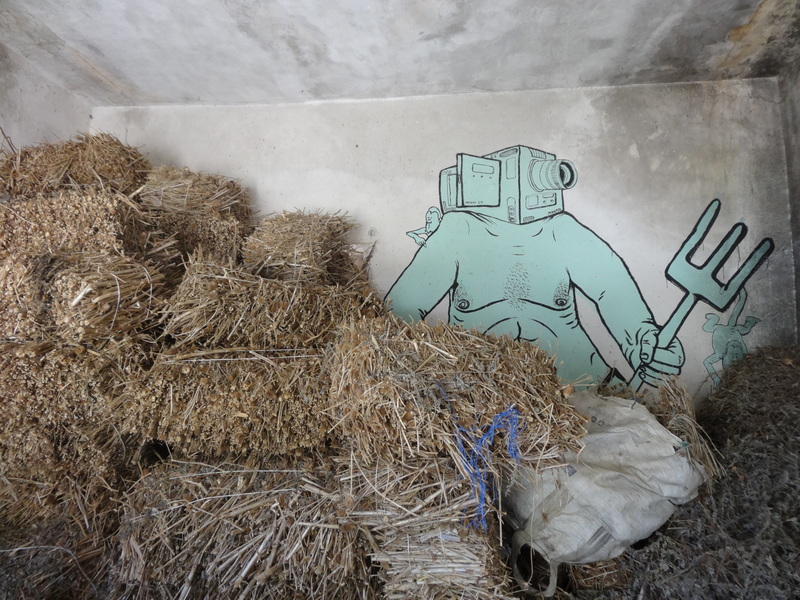 Not only was there more street art, but there was also gigantic piles of çaj mali (Albanian mountain tea) everywhere. I was so surprised to find enough tea to supply an entire village for the whole winter. 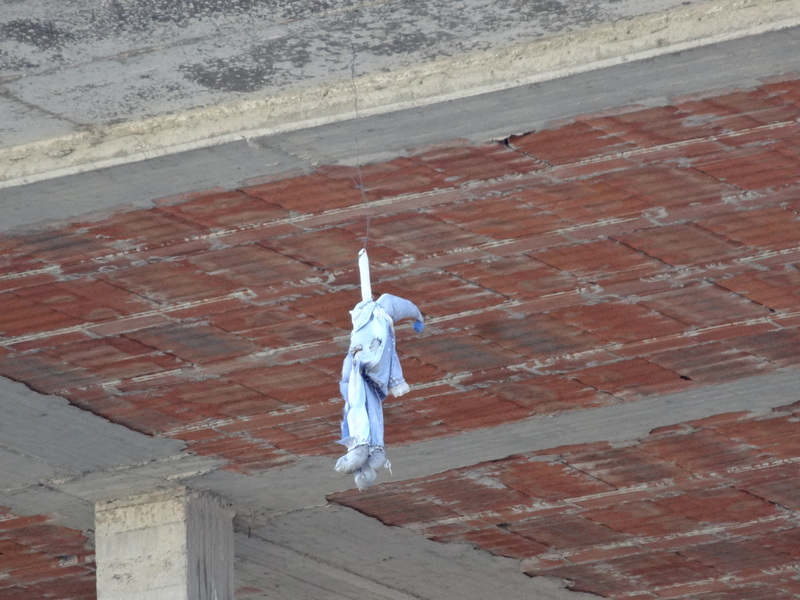 It was so unexpected and I definitely think it was one of the coolest things I’ve experienced in Albania. 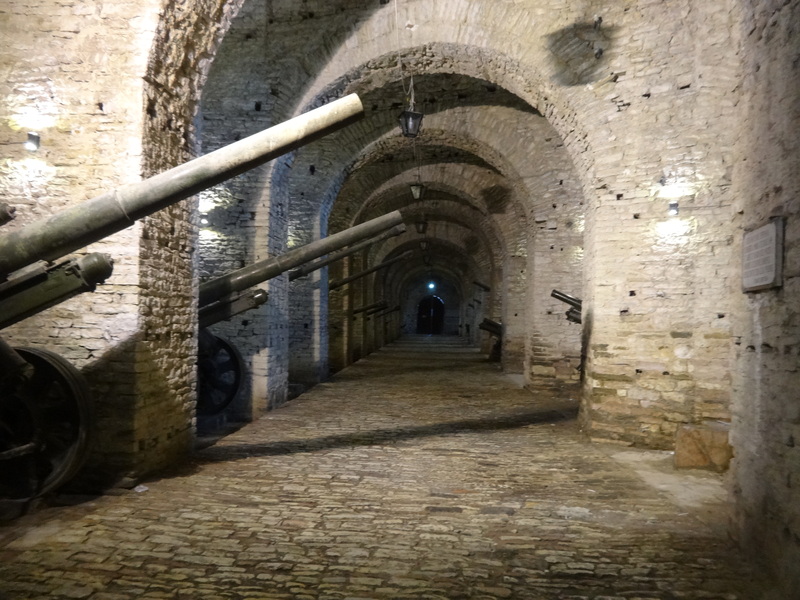 Then we went to the castle, which was also pretty neat, especially for those historian buffs. 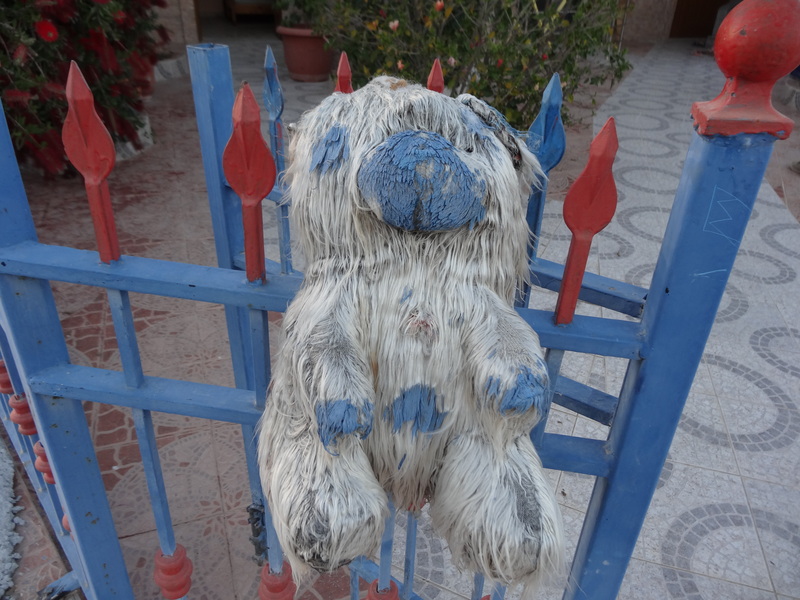 As we continued our way down the winding road I was curious if we’d ever make it to Saranda. Even though Albania is a small country, about the size of Maryland, it sure does take a long time to travel across. We also took the scenic coastal road, which added on several hours of winding roads. 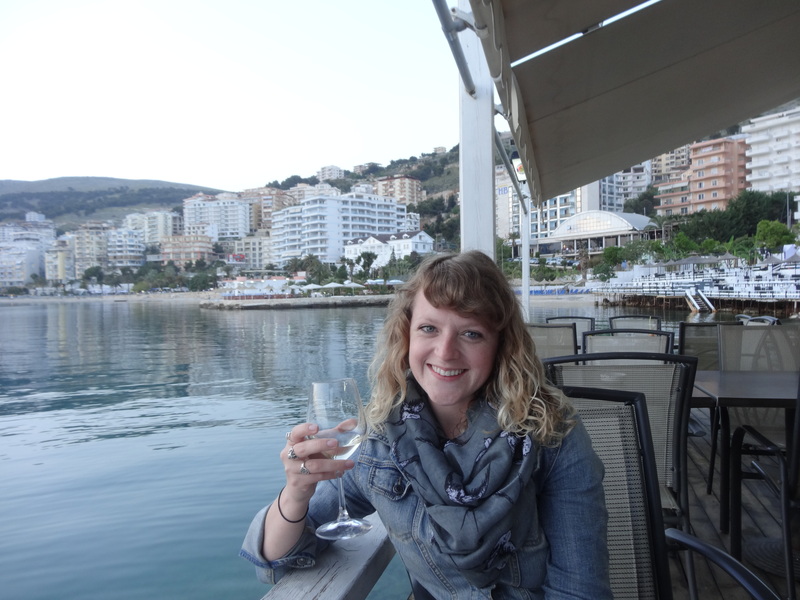 After we finally made it to Saranda we had lunch near the port with the volunteer who lives there and she gave us some suggestions on things to do in the area. We made it down to Ksmail in the mid-afternoon and went for a swim and a xhiro around town. The water was crystal clear and pretty warm once you got used to it. 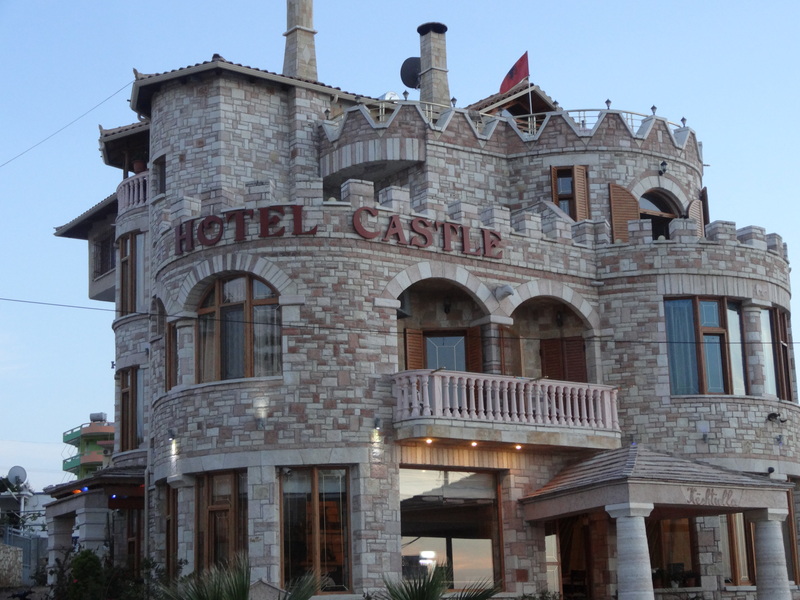 We stayed an extra night at Hotel Castle in Ksamil so that we could go on a mini day-trip to the best-preserved UNESCO heritage site in Albania. 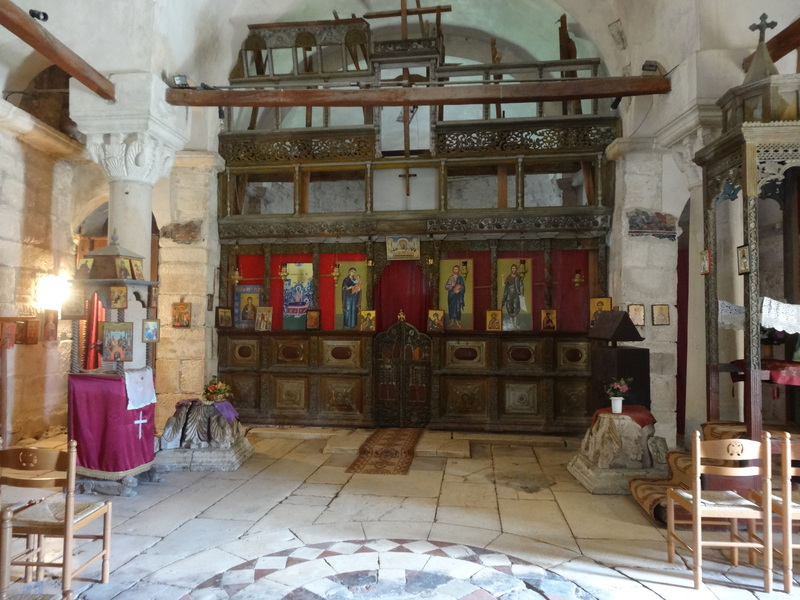 It is another must-see if you are in southern Albania. 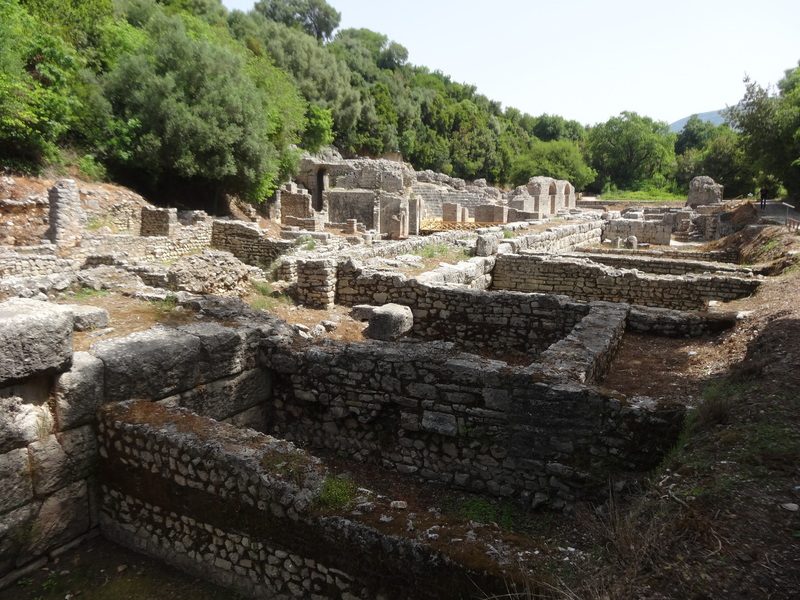 We spent hours walking around the various sites in Butrint and one could honestly spend an entire day exploring and reading about all the history from that region. 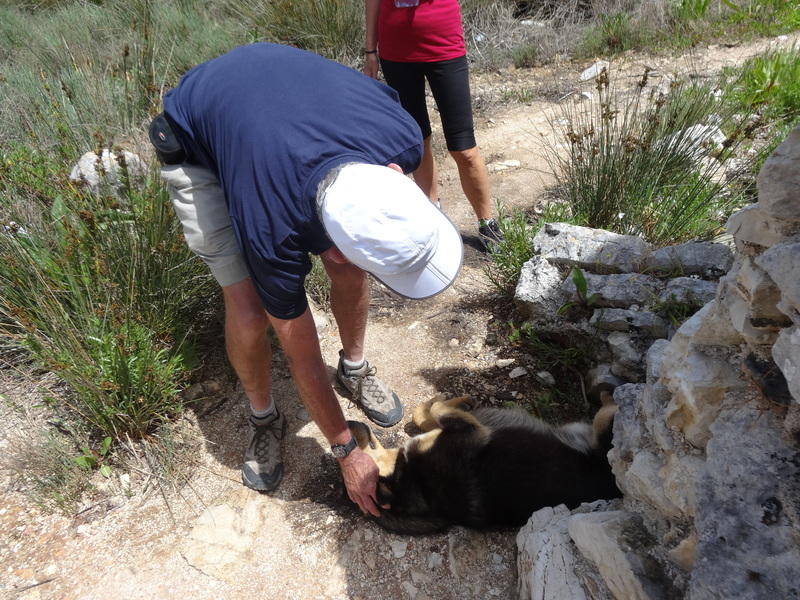 My dad even met a new friend, a random sleeping dog, off one of the main roads while we were hiking around Butrint. In the afternoon we went for another swim and then had the best seafood dinners I’ve had in Saranda at Demi Restaurant. One plus to having tons of delicious fresh seafood is pairing it with the tasty, yet cheap, white wine. The next day we continued our journey back up north to Gjirokaster. 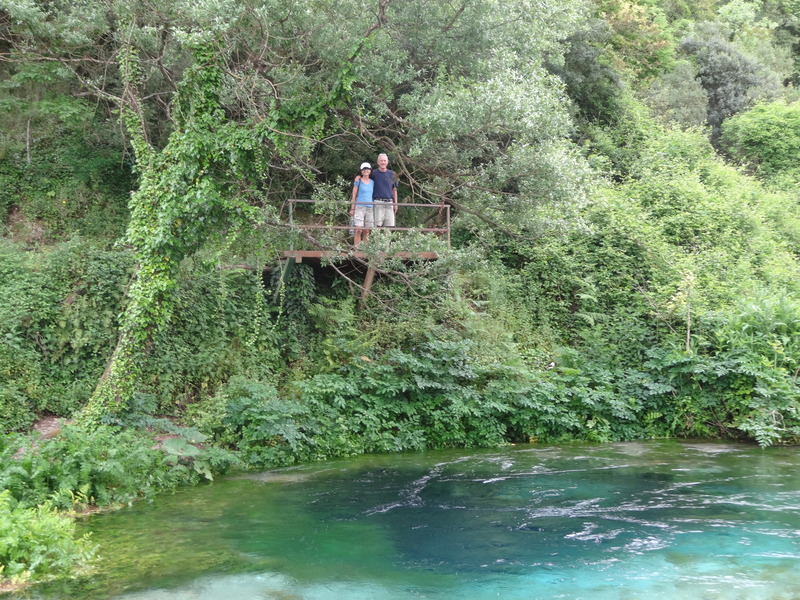 Along the way we stopped at the southern blue eye, which was on my Albanian bucket list. Thanks dad! At the blue eye we were able to relax right next to the water and have an afternoon coffee to keep us going for the rest of our drive north. 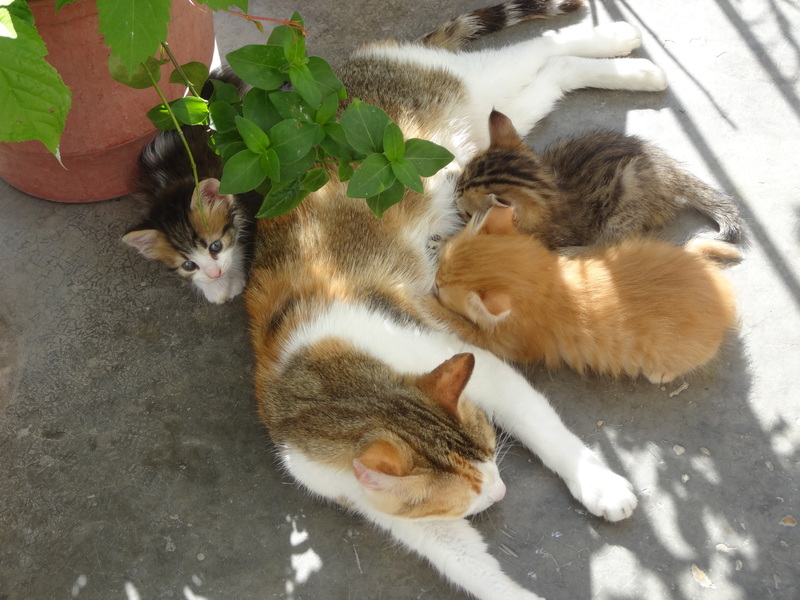 In Gjirokaster we stayed at an adorable, traditional bed and breakfast. 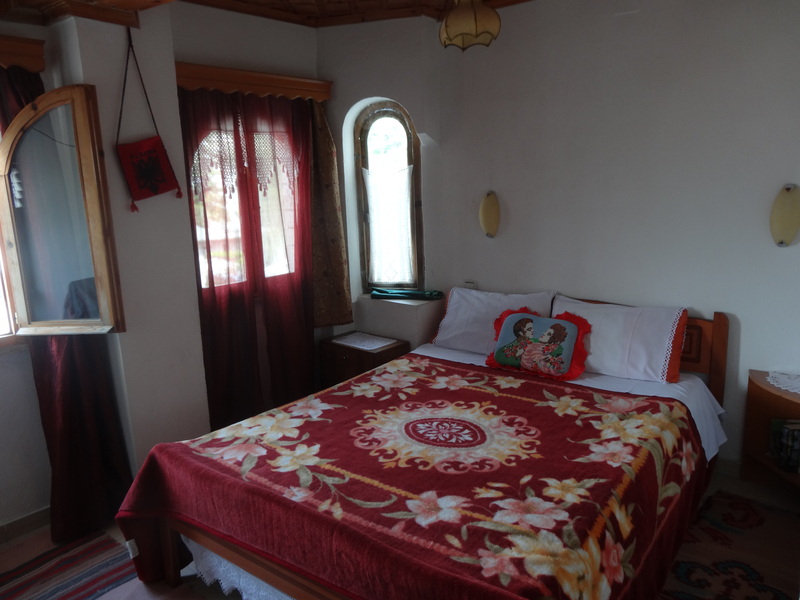 Kotoni BnB was a great deal because it was inexpensive and the hosts were great! Both of them spoke fluent English, gave us tips on things to do in Gjirokaster, and provided a pretty nice breakfast complete with Turkish coffee and mountain tea. 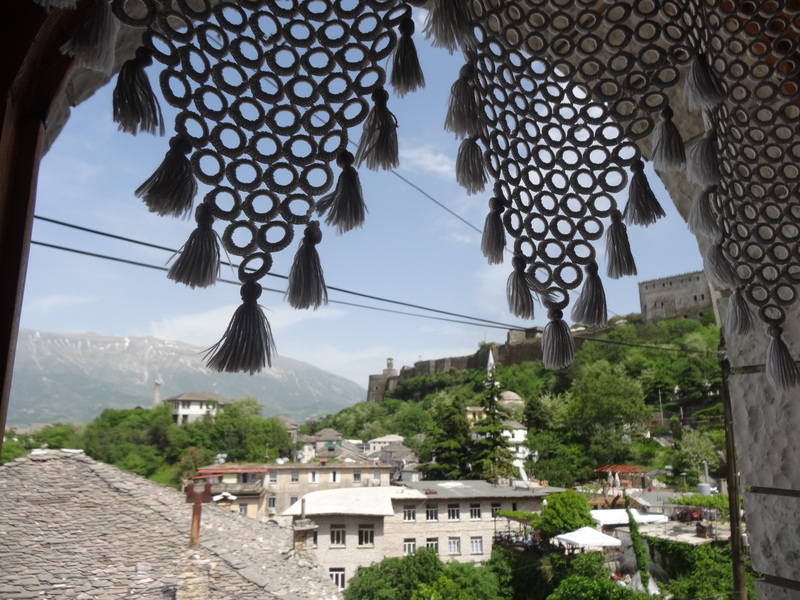 Both rooms we had gave us a lovely view of the castle and old town Gjirokaster. Definitely a place that I would recommend staying at! 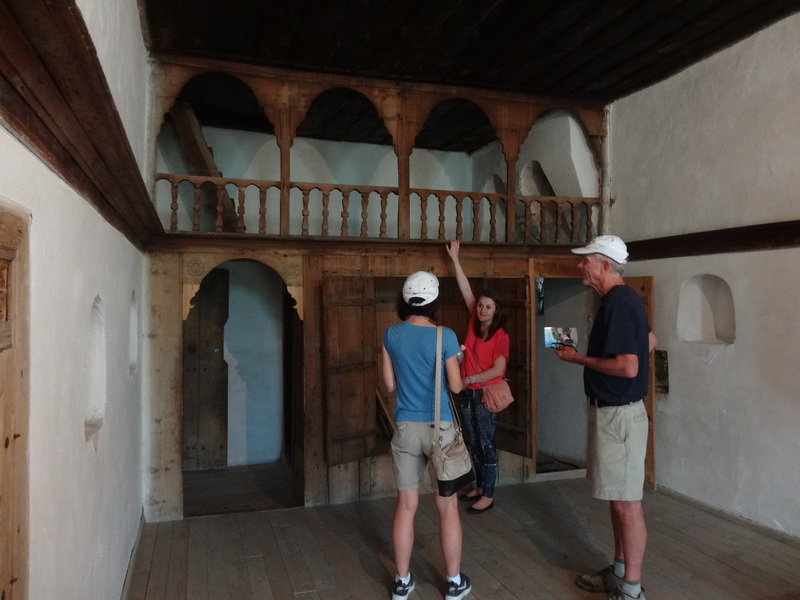 We toured some traditional houses in the city and also went up to the castle. 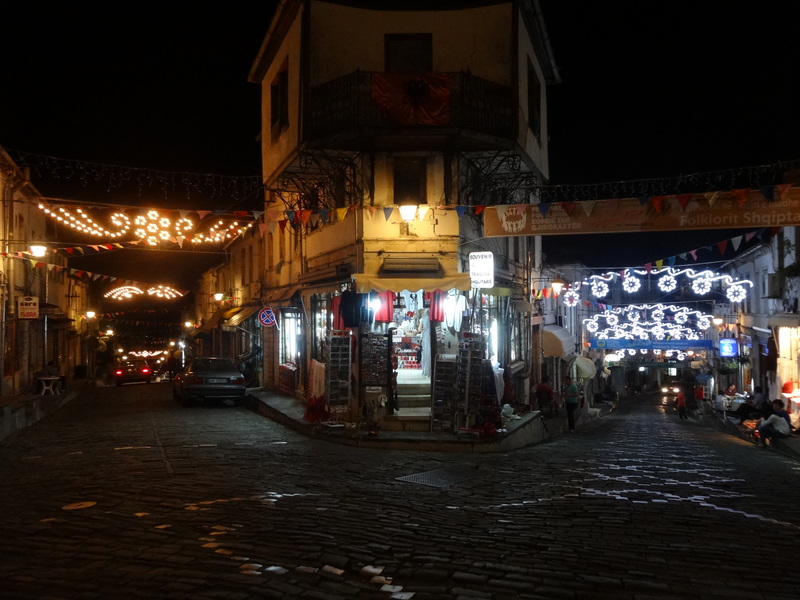 The city was preparing for the traditional Albanian folk dance festival, so tourist season was just about to begin. If only we had planned their vacation a week later we could have experienced some traditional valle dances from different regions all over the country. Of course we tried lots of traditional Albanian food all throughout our trip and we couldn’t leave Gjirokaster without trying qifqi, rice balls made with egg and seasoning, a dish known in the Gjirokaster region. 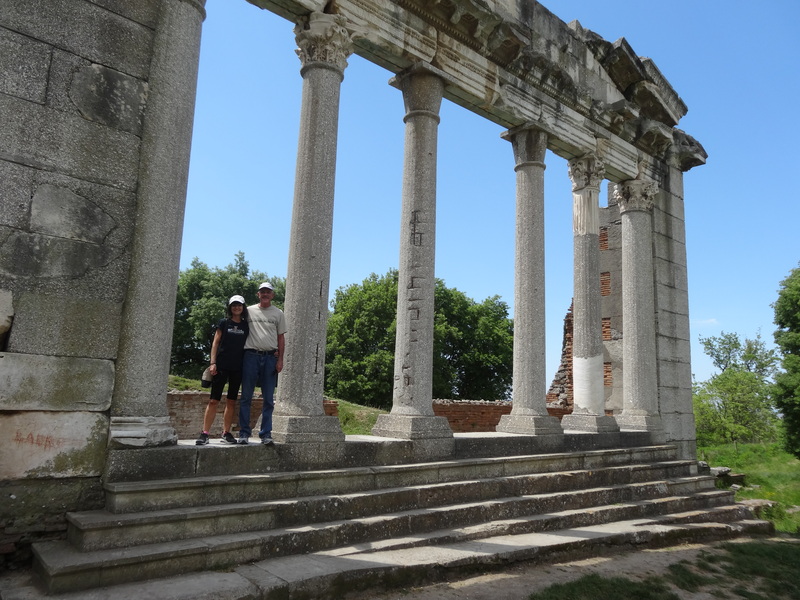 My parents trip came to an end and we traveled back up to Tirana so that they would be ready for their early morning flight at 5am the next day. If you have some time in the Tirana area before you go other places I would recommend checking out are Kruje and Mt Dajlti. There is a cable car that runs up Mt Dajti and there is a traditional market and castle in Kruje (plus there is also a statue of US President George W. Bush). If you’re staying longer than a week in Albania, I would recommend spending an extra day down south and going to the Benji hot springs near Permet. Northern Albania is also especially beautiful because it is full of mountains and friendly people. Shkoder is a beautiful city with a great evening xhiro and a beautiful lake (plus another castle). 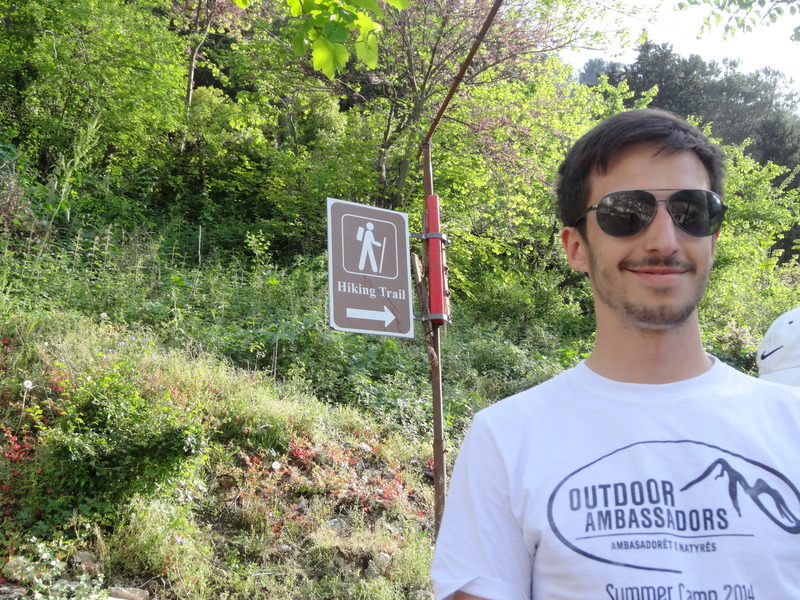 And if you like hiking you should check out the hike from Valbona to Thethi in the summer months! 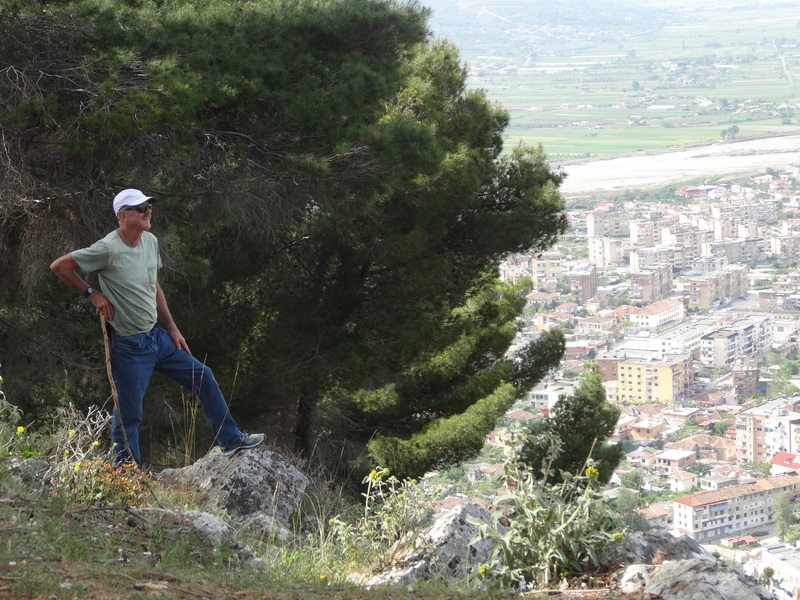 I am so happy that I was able to share a bit of wonderful Albania with my dad, Nancy, and my mom back in March. Now I feel like my family a better understanding of where I have been living these past two years. 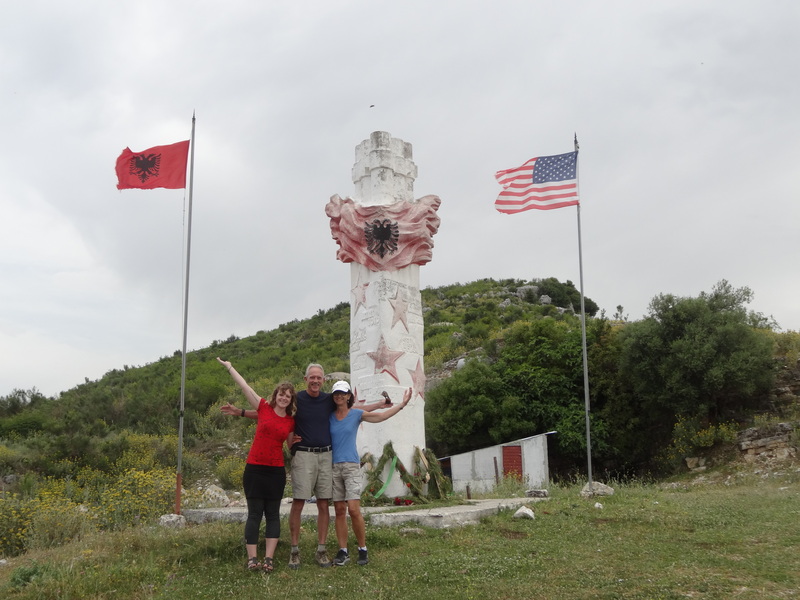 Goal three of Peace Corps is to share Albanian culture with people back in the states and there was no better way for me to show them with Shqiperia has to offer than by giving them a complete tour. This trip was also very special for me because I am used to living the lifestyle of a volunteer and it was interesting for me to experience Albania as a “tourist.” The country is really making great strides in the tourism industry and I know that in five to ten years Albania will be one of the top spots to visit in the Balkans because of the stunning nature and hospitable locals. 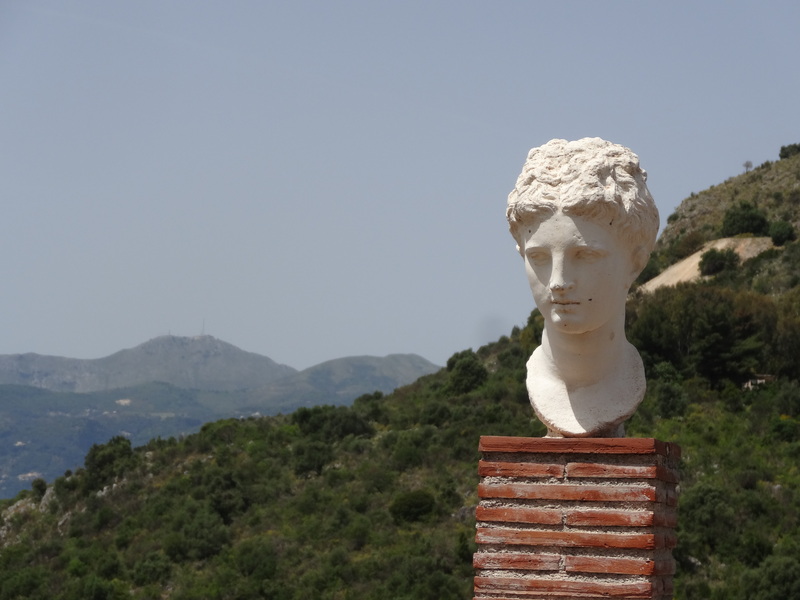 Just FYI, Albania was voted #4 of the top 52 places to visit by the New York Times in 2014. So this is me telling you that you should visit Albania while it’s still cheap and undiscovered! Write On! 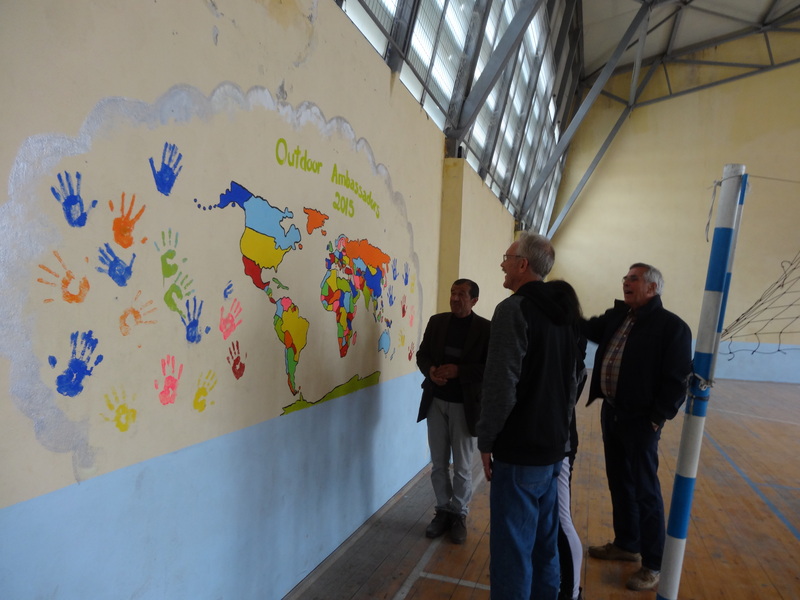 is a regional Peace Corps creative writing contest to develop writing skills, creativity, and give students the ability to just sit down and write something original. 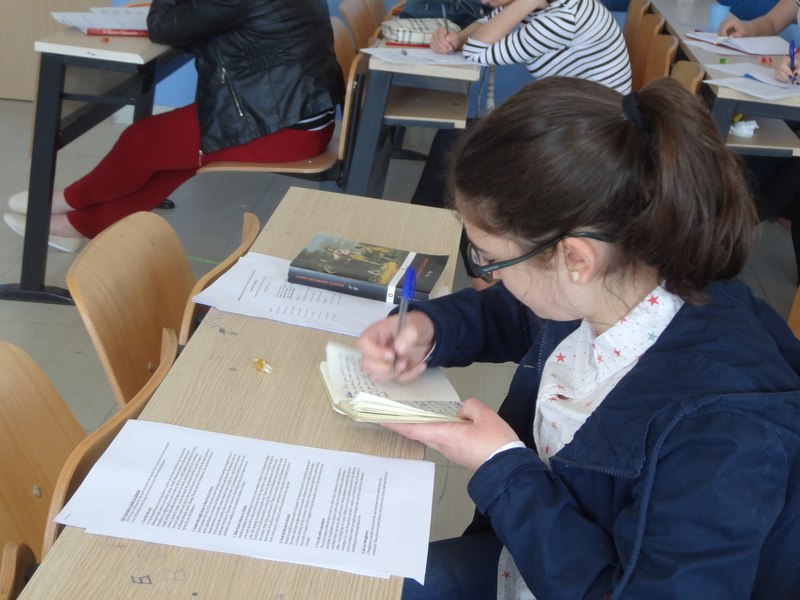 In Albania, many students participate in after-school creative writing clubs to warm-up for the actual contest. Last year a student from Kavaje attended the national conference after I opened up the contest to students at the high school. 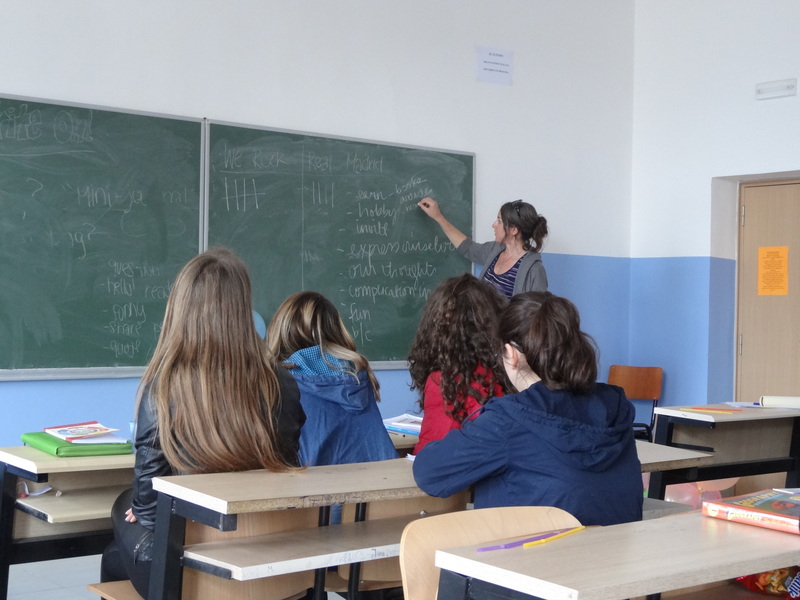 Write On is extremely important here in Albania because creativity can often be left behind in the classroom and many students aren’t encouraged to be original and think outside of the box. It is common for people to plagiarize and copy other students, but having creative writing clubs and contests really allows students to come up with something on their own without the pressure inside of the classroom. 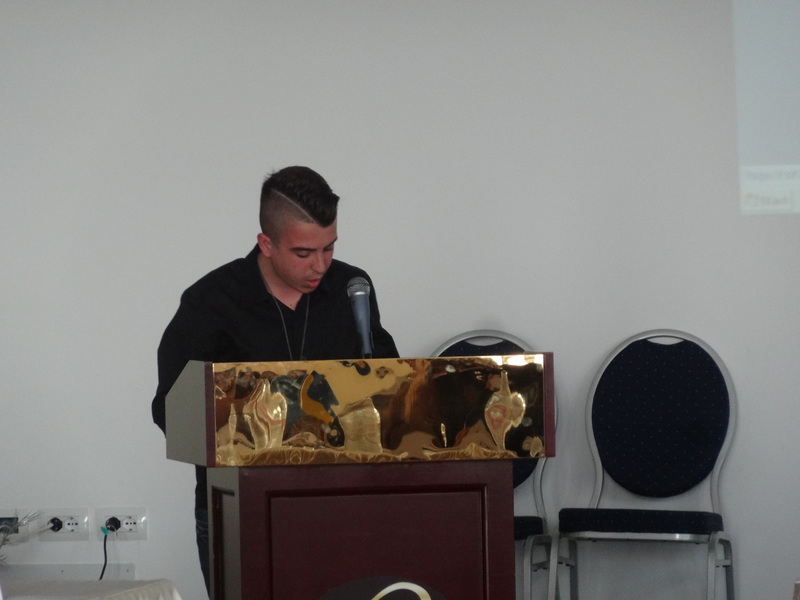 Recently I helped run some sessions at the one-day Writers of the Future conference in Tirana. 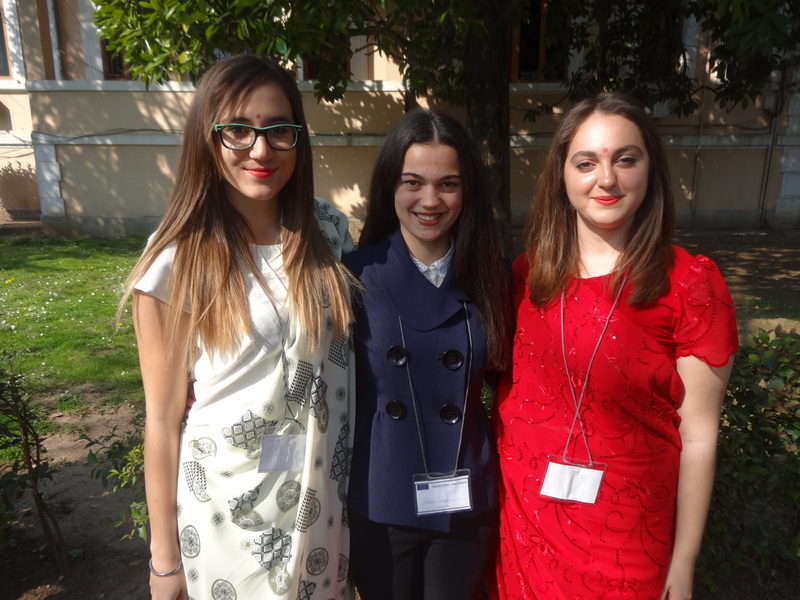 The Writers of the Future conference was a one-day conference for the students only from Tirana. 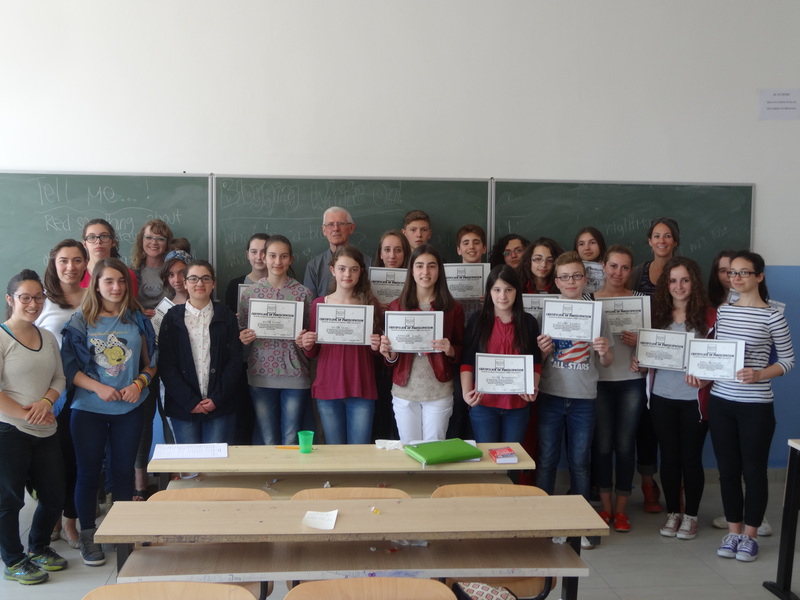 There is a separate conference for them because many of the schools in the capital city participated in the contest due to the perseverance of an amazing Peace Corps volunteer that lived there. 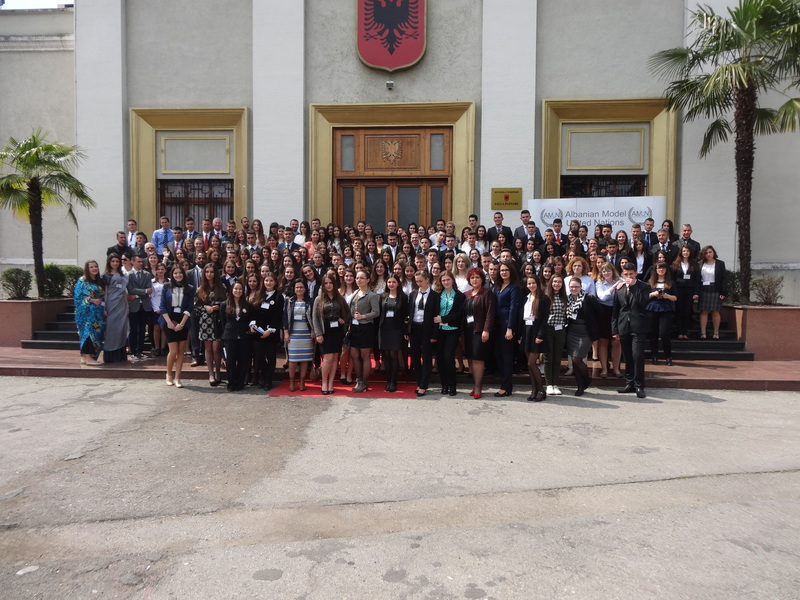 There was also another separate Write On conference held the same weekend for students from around the country. 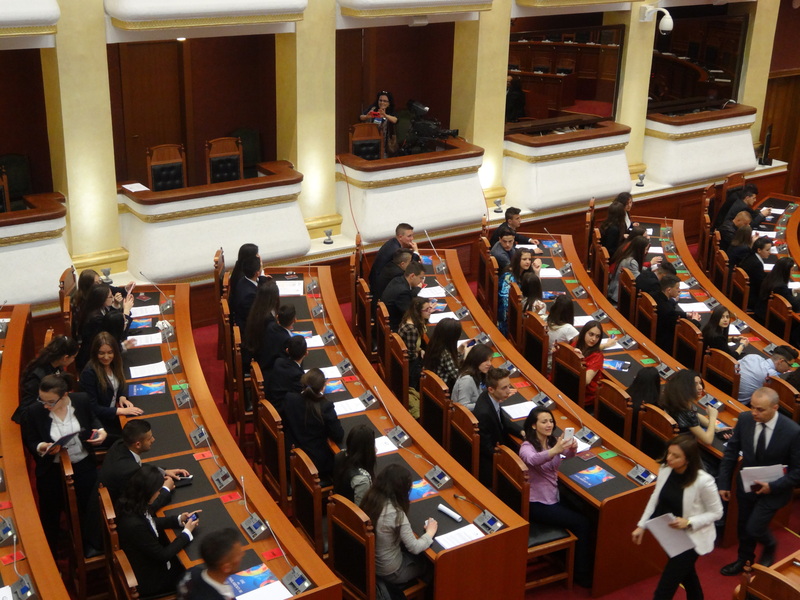 Over a thousand essays were submitted from Tirana alone. 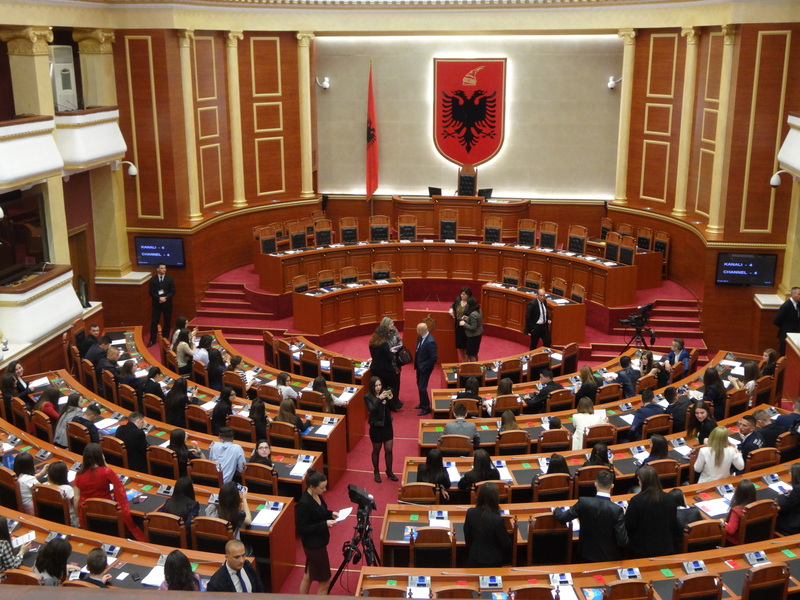 Over two thousand were submitted from Albania, which is far more than all the other Write On countries combined. 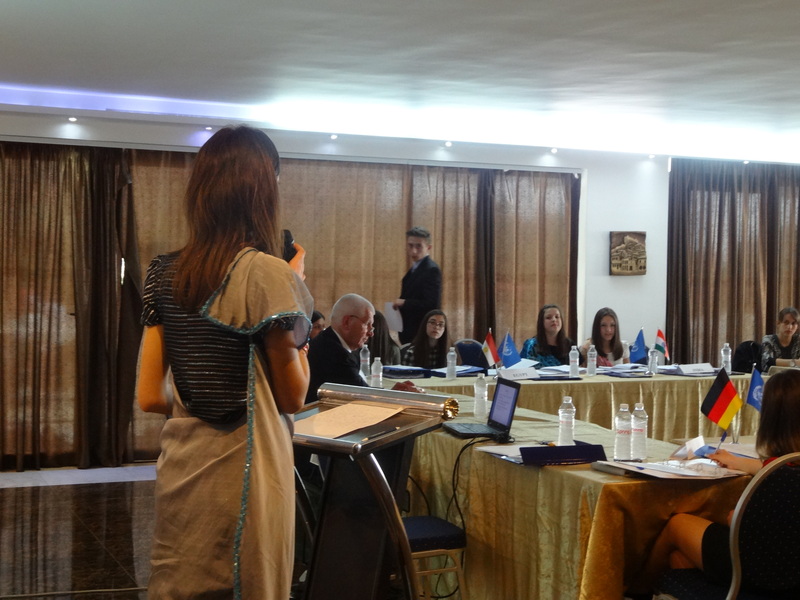 Four other Peace Corps volunteers, an Albanian counterpart, and I led sessions at the Writers of the Future contest. There were sessions such as comic book writing, theater, dance, lethargic writing, and much more. I facilitated a session about blogging and another game session to liven up the students in the afternoon. 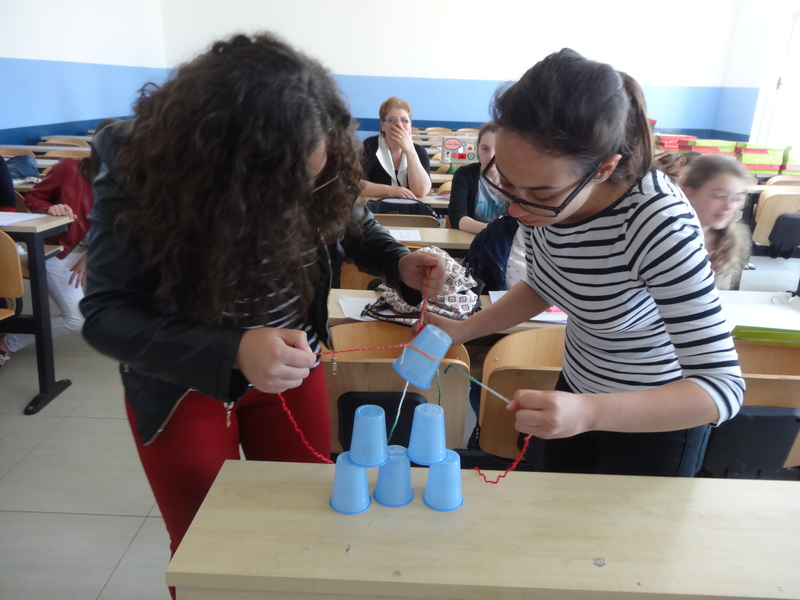 The games session was a lot of fun because I made it competitive with a lot of “minute-to-win-it” challenges. 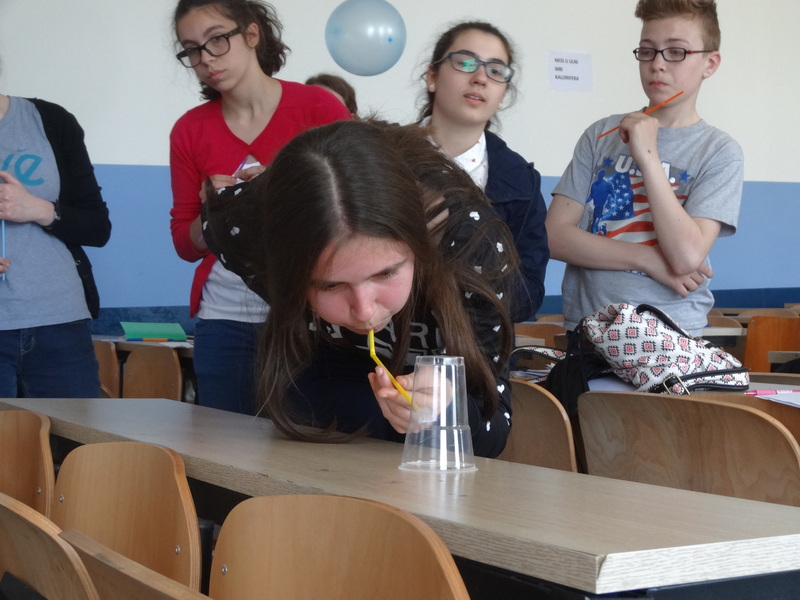 The students seemed to enjoy it. 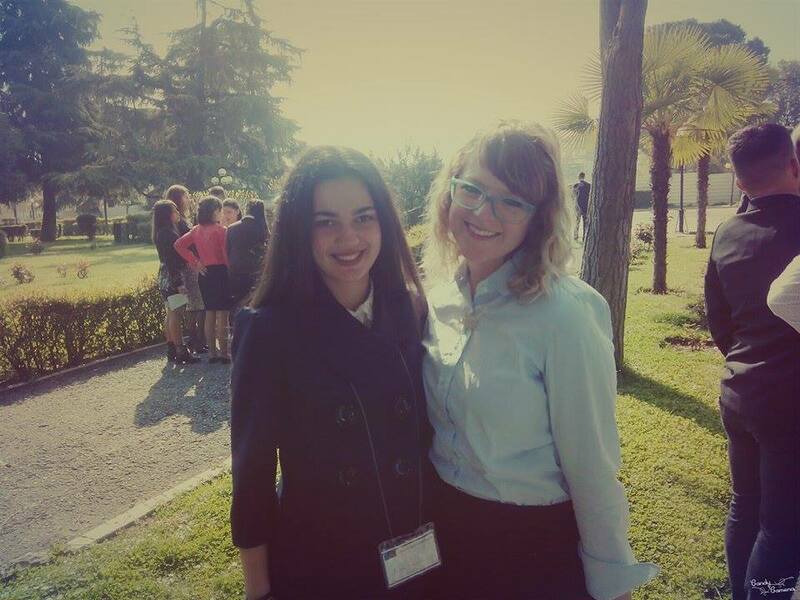 Since September 2014, my site-mate Chuck and I have been working together with a group of nine high school students for Model United Nations. I have mentioned our work before in a previous blog post. 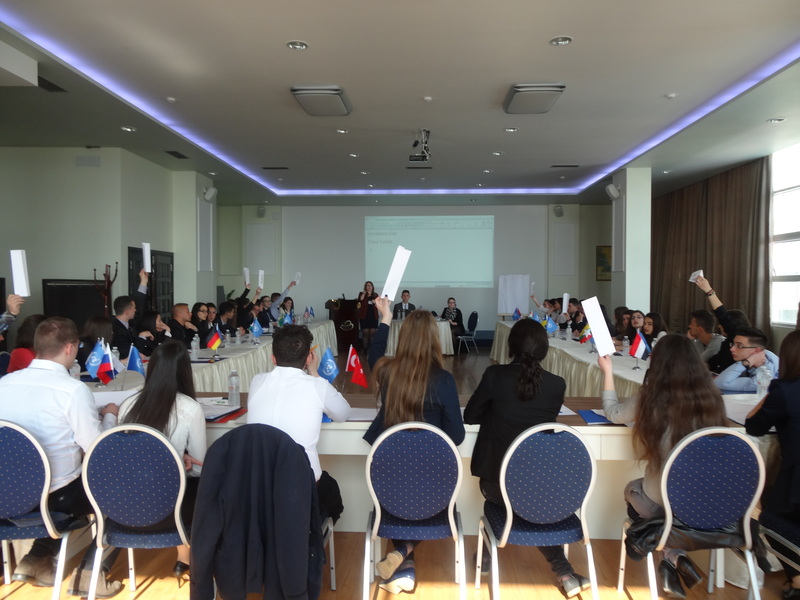 For those of you who are not familiar with Model UN, it is “an educational simulation in which students learn about diplomacy, international relations, and the United Nations. 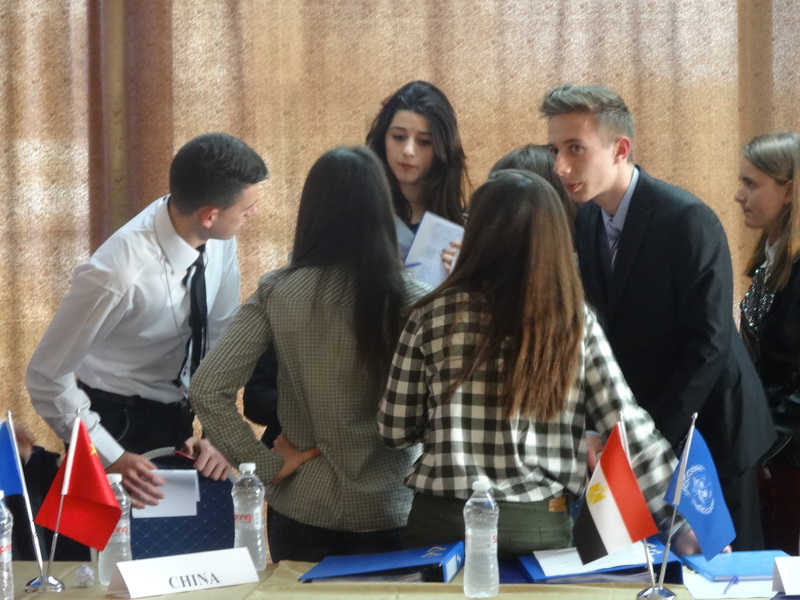 MUN involves and teaches research, public speaking, debating, and writing skills in additional to critical thinking, teamwork, and leadership abilities.” I created this video for the opening ceremony for the conference. 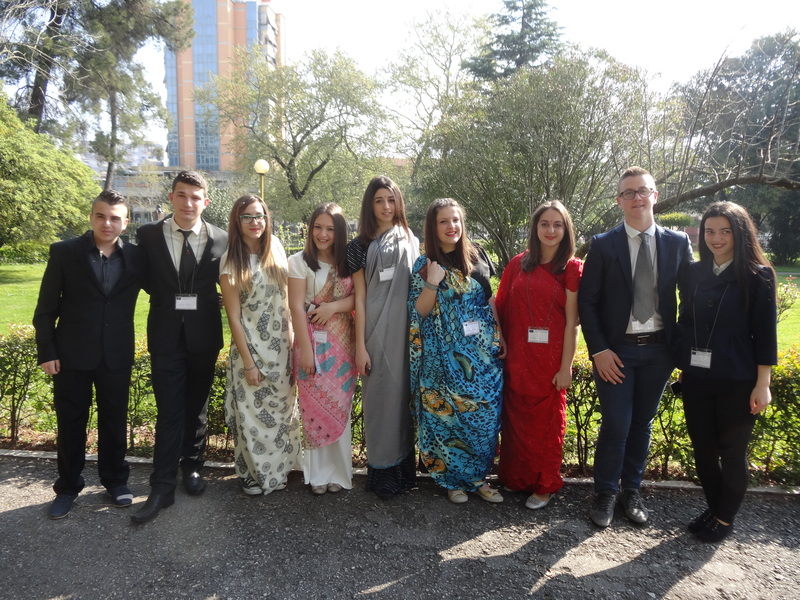 The team from Kavaje represented the country of India in three different committees during the conference. The ECOSOC committee debated coordinated action against human trafficking: the costs of human trafficking to development, protecting refugees and marginalized groups, the rule of law in the fight against transnational organized crime and human trafficking; the Security Council debated conflict prevention and mitigation: measures to combat terrorism and trading in illicit markets, preventing regional escalation of internal conflicts in MENA countries, preventing and reducing conflicts over natural resources; and the General Assembly debated achieving sustainable development: prioritization and implementation of the sustainable development goals, enhancing global partnerships through tri-sector development, preconditions of sustainable development. 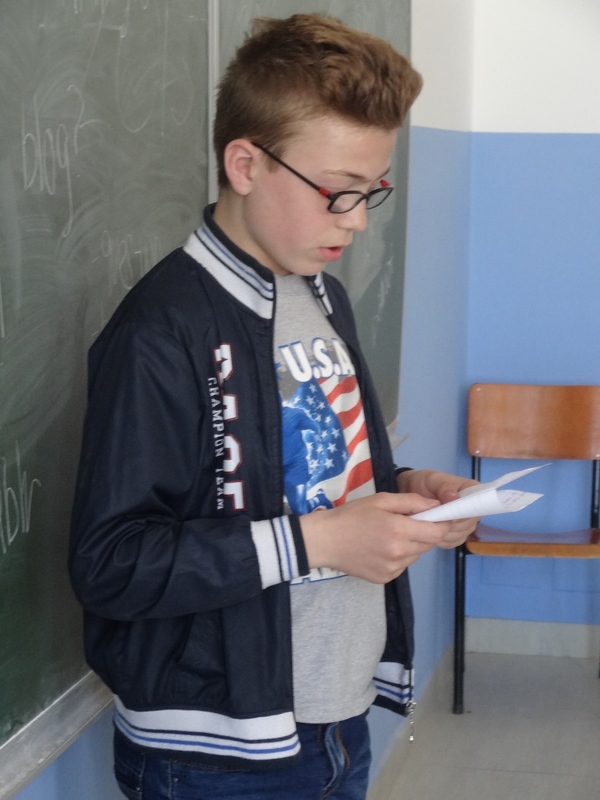 Each team of students was required to do a community project in their towns. Our team donated over 500 books to the Kavaje Young Adults Center (KYAC). 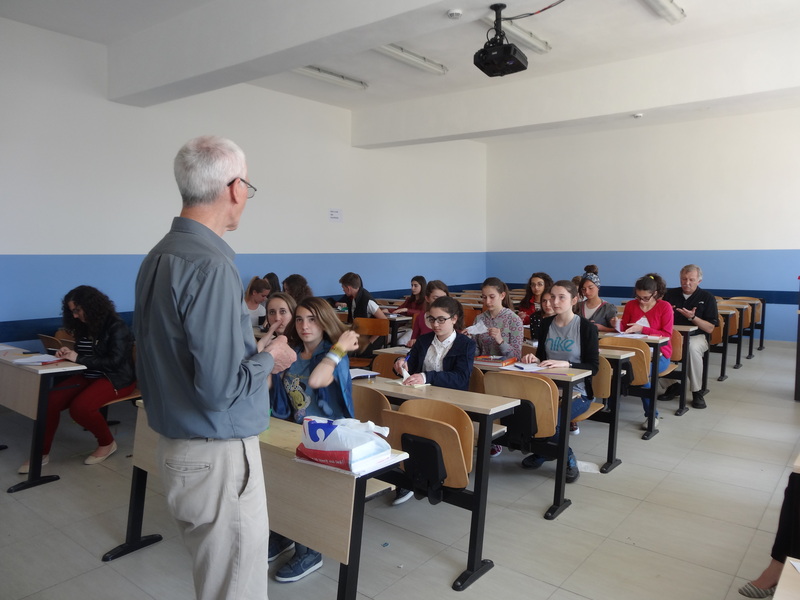 We were able to work together with a Peace Corps volunteer in Tirana to obtain the books from a generous organization called Books Abroad Scotland. Each of the students raised money to help pay for the shipping of the books and now all of them are available to check out from our youth center. We created this video to explain the project. Throughout the duration of the program, my team met twice a week on Mondays and Thursdays for one hour. 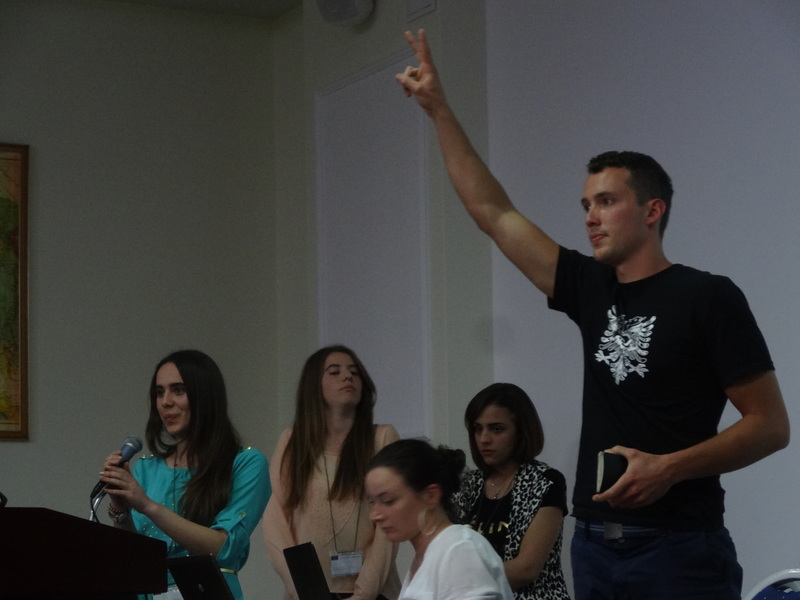 The students had to research their topics ahead of time and come prepared to each meeting. They learned about United Nations rules and procedures, current events, and how to represent India in the most accurate way. 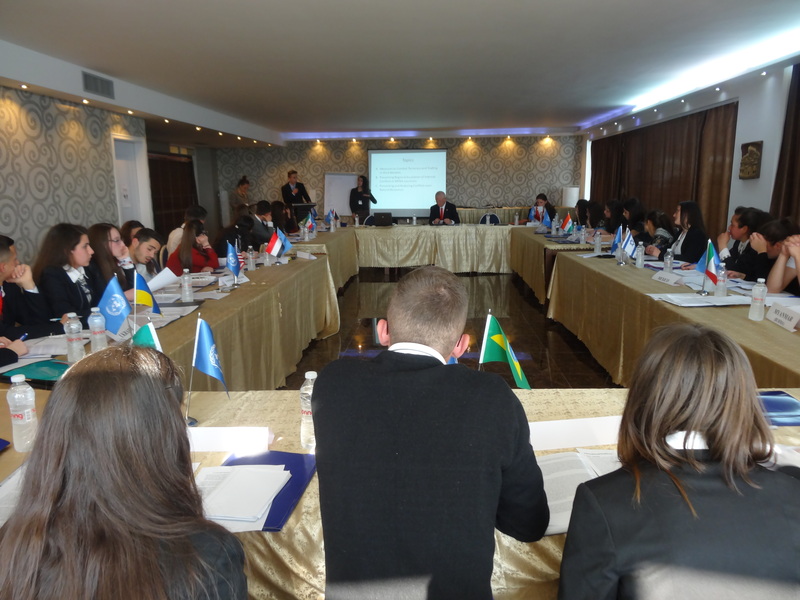 They also visited the UN House and heard members from different sectors of the United Nations speak about their work. 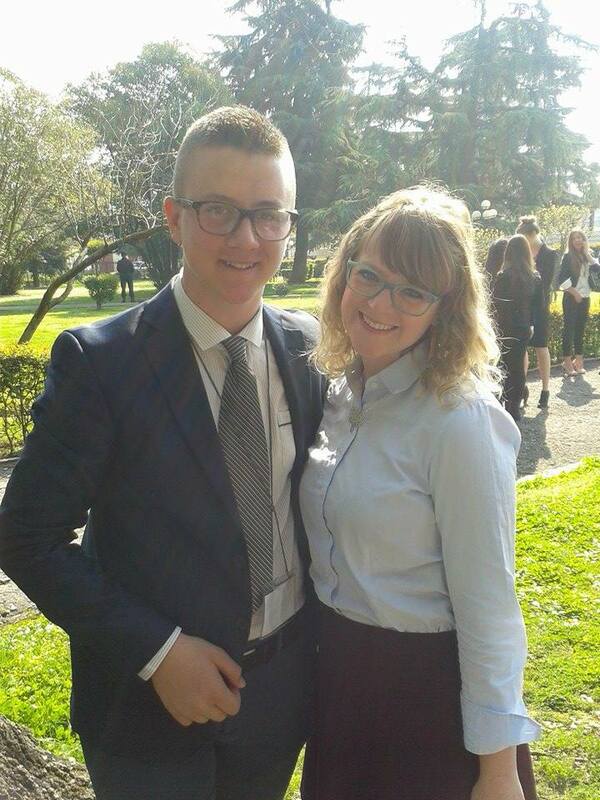 They also had the opportunity to visit and tour the US Embassy. 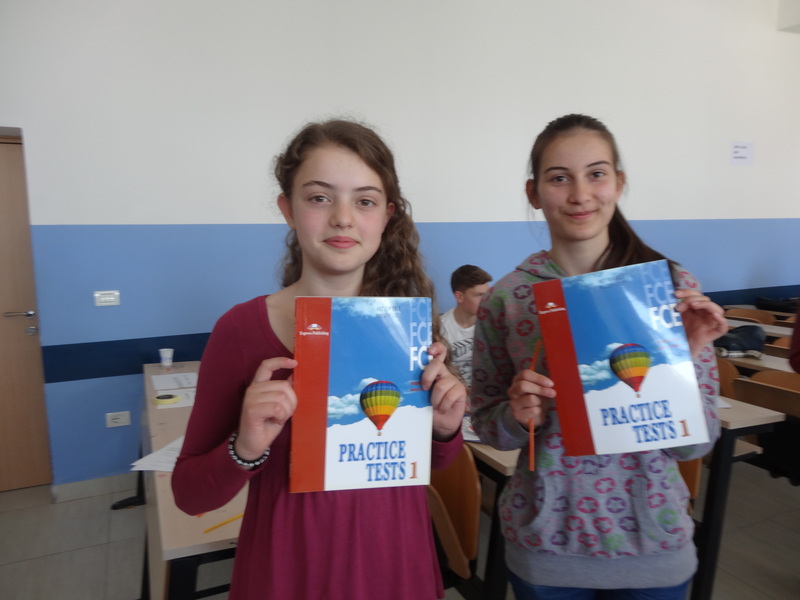 It was really quite an interesting (and educational) program for the students involved. 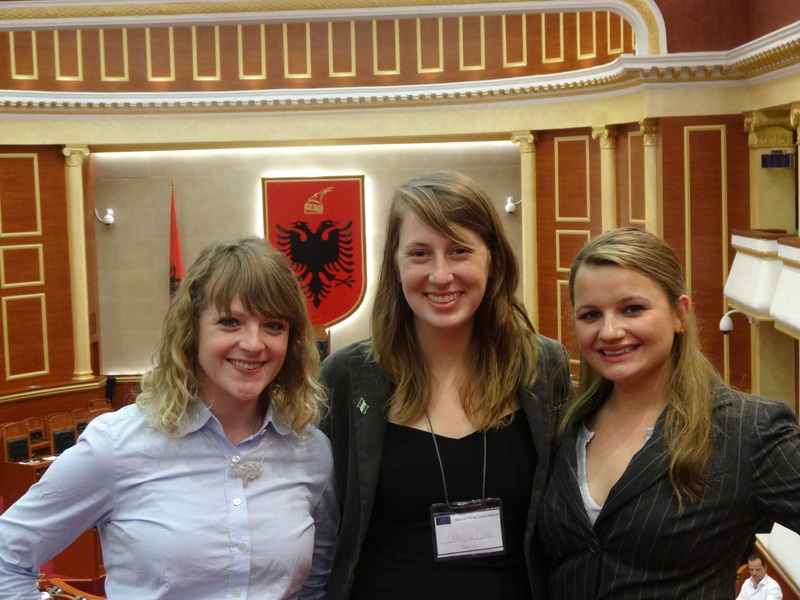 The Model UN conference was definitely a highlight of my Peace Corps service. 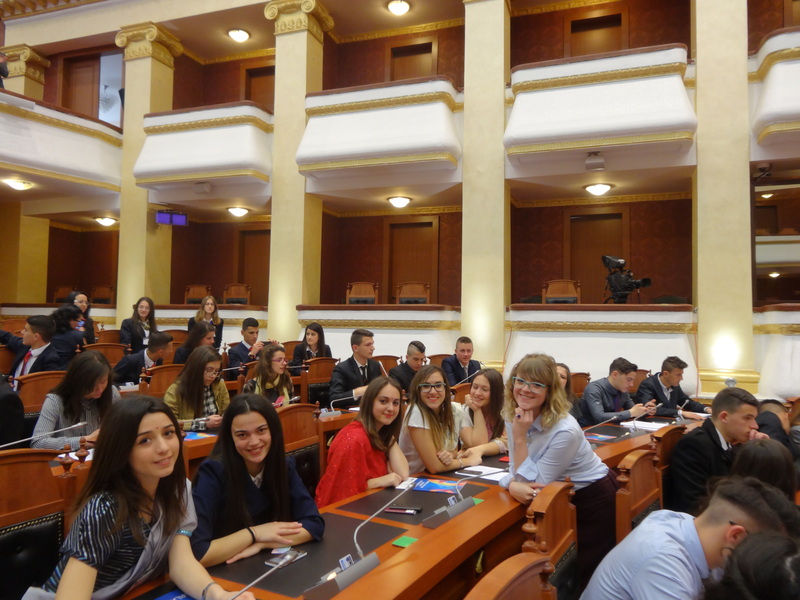 It was great to watch my students’ debate with other bright young adults from across the country. I could really tell that all their hard work paid off. 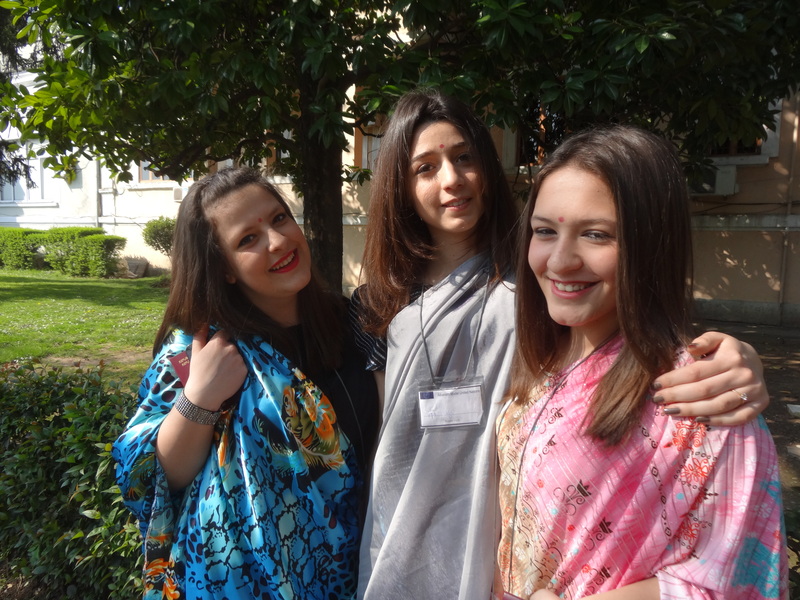 The final conference was full of debate and fun activities during the downtime including a picture scavenger hunt, dinner mafia, a talent show, and a student dance. 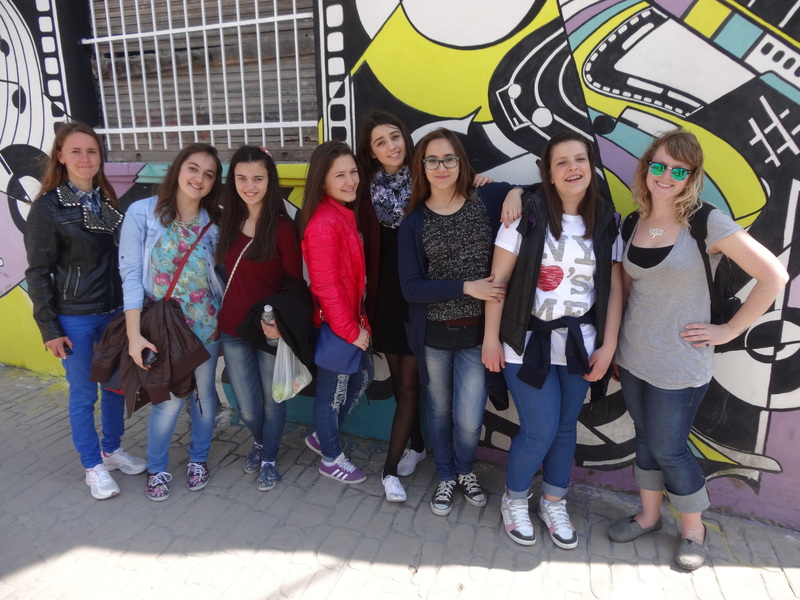 To celebrate the end of a long six months of Model UN, I took some of the students to Tirana for a fun day out. We went to go see the Fast and the Furious movie and after that we went bowling. 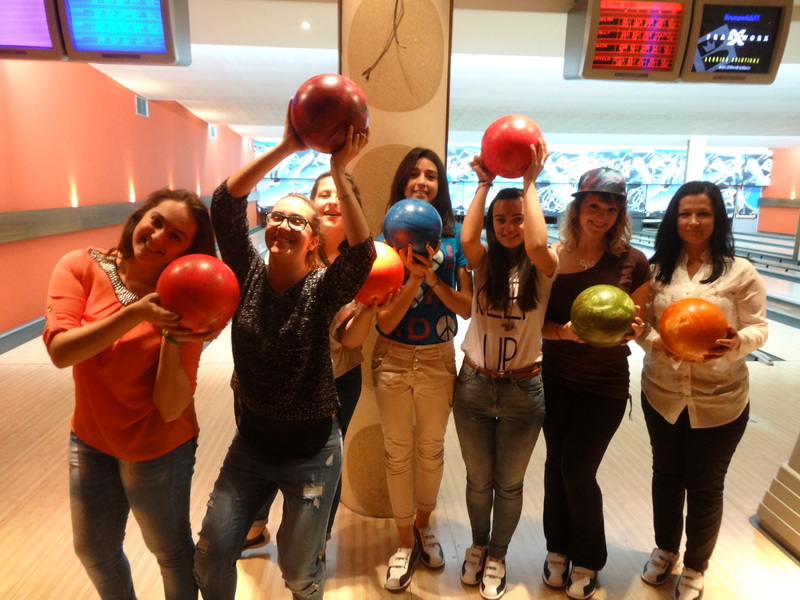 It was the first time that everyone had been bowling, so it was nice sharing a part of my culture with them (Peace Corps goal 2 everybody)! 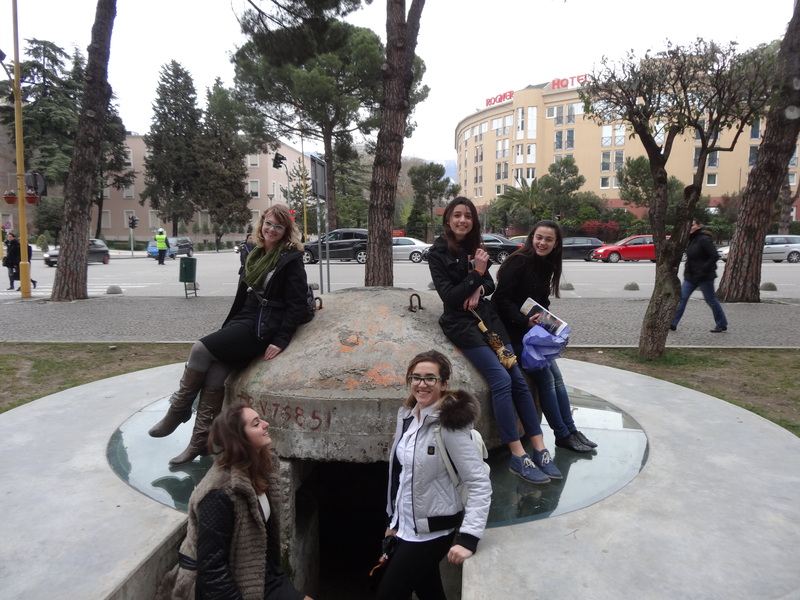 Hanging out in Tirana after our USA Embassy visit. 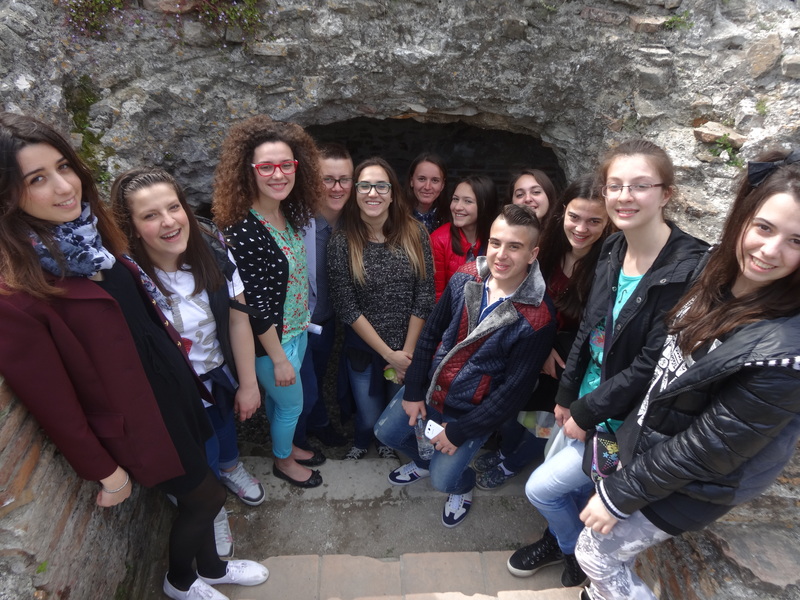 On the Durres walking tour before the conference. 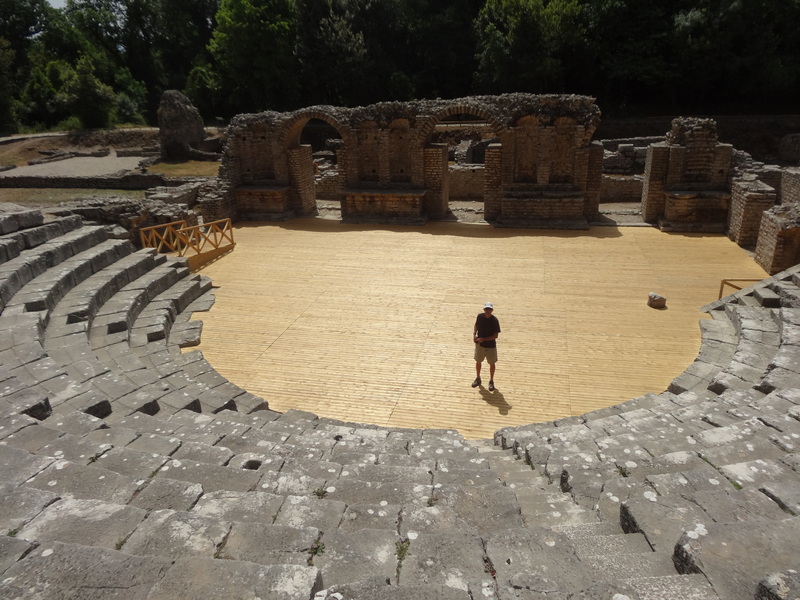 Our group at the Durres Amphitheater. Tyler the MUN coordinator in action. Can you spot my students? 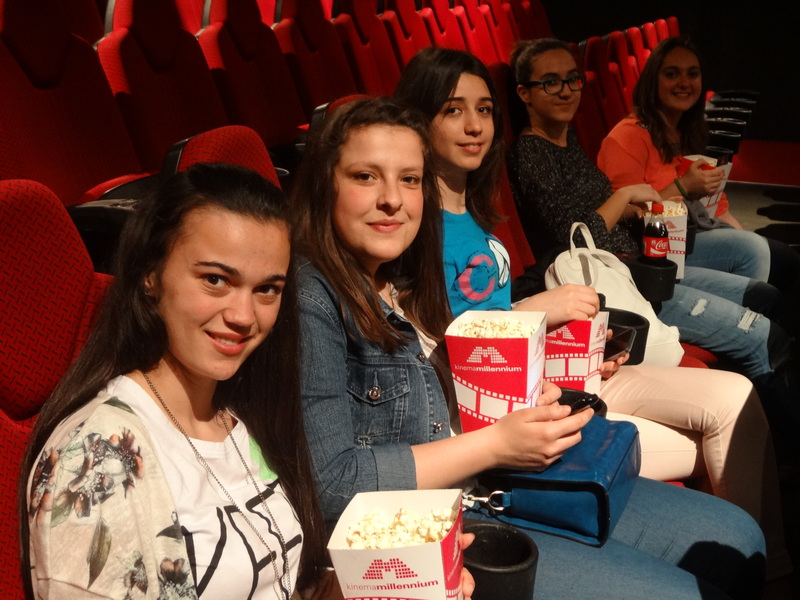 Hanging out in Tirana at the movies to celebrate the end of AMUN and Ambra’s birthday!